The error says “something went wrong” and “Ref A: a long string of Hex Ref B: AMSEDGE0319 Ref C: Date Time”. The server name in Ref B will change as well. It also says “more details” and if you click that there are no more details, but that text changes to “fewer details”. 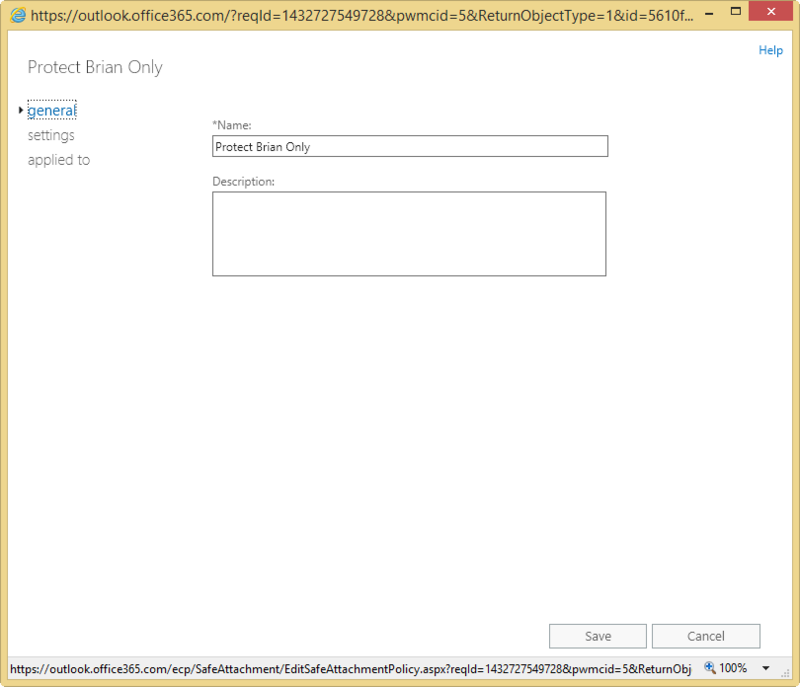 As far as I have seen, this only appears on Outlook Web Access (OWA). What you see in the error message is OWA’s way of telling you that you cannot get to that site from where you are. That you have failed the conditional access tests. 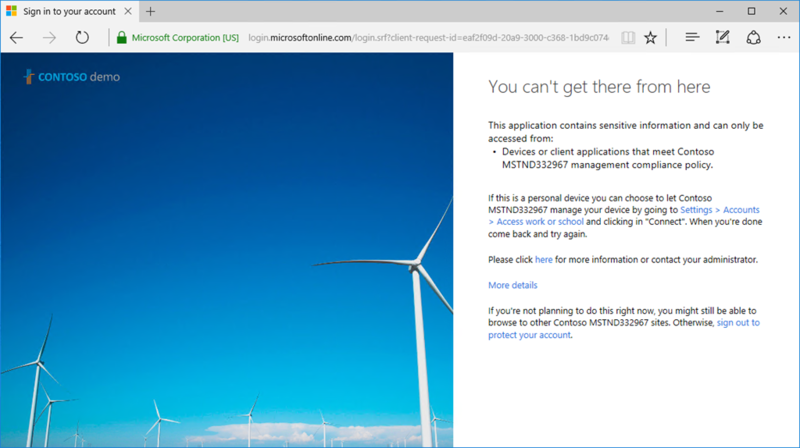 This says “you can’t get there from here” and the reasons why you have failed conditional access. 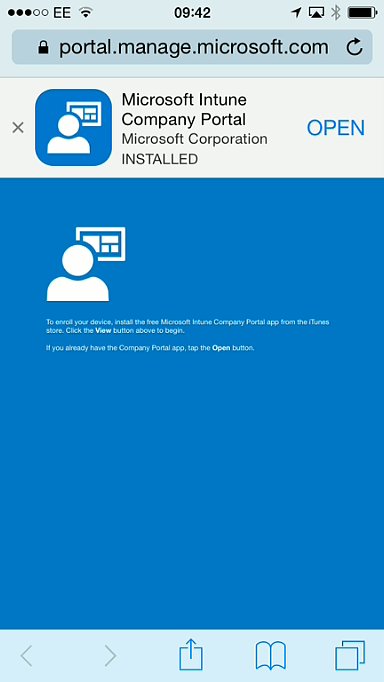 If you were on a device or location that allowed you to connect (such as a device managed by Intune and compliant with Intune rules) then going to OWA directly will work, as will going via the menu. So how can you avoid this odd error message for your users. 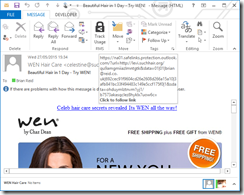 For this, you need to replace outlook.office.com with your own custom URL. For OWA you can create a DNS CNAME in your domain for (lets say) webmail that points to outlook.office365.com (for this it will not work if you point the CNAME to outlook.office.com). Your users can now go to webmail.yourdomain.com. This will redirect the user via Azure AD for login and token generation, and as you are redirected via Azure AD you will always see the proper, language relevant, conditional access page. For the last few years Exchange Online mailboxes have been processed by a service call Clutter, which moved the less important emails, or indeed the clutter, to a dedicated folder. This is now in the processes of being replaced by the Focused Inbox, which is client version dependant and is all based on views on the mailbox and not different folders. The way to ensure mail is not marked as clutter, or shown in the Other view when your mailbox is processed by the Focused Inbox, is to mark the item as such, or to actively engage with the item. That is if you reply or read the emails from these recipients they do not go into Clutter/Other, but if you ignore them or delete them before they are read then this makes them candidates for future processing by the Focused Inbox or Clutter engine. The processing engine for Clutter/Focused Inbox will not place items from your Direct Reports or management chain in the Other view/Clutter folder nor will it place any emails from yourself into the low priority location. The Direct Reports and your management chain is known to the processing engine as it is part of Active Directory. So as long as your manager (and everyone else’s manager) attribute is populated in Active Directory and synced to Azure Active Directory then this configuration can be honoured. 1: New-TransportRule -Name "Bypass Focused Inbox" -SubjectContainsWords "This is a placeholder rule that does nothing, change this action to suit the requirements of the client" -SetHeaderName "X-MS-Exchange-Organization-BypassFocusedInbox" -SetHeaderValue "true" -Comments "<date> - <name> - Any mail that meets the conditions of this rule will go into the Inbox or Focused Inbox and not the Clutter or Other folder in Exchange Online"
2: New-TransportRule -Name "Bypass Clutter" -SubjectContainsWords "This is a placeholder rule that does nothing, change this action to suit the requirements of the client" -SetHeaderName "X-MS-Exchange-Organization-BypassClutter" -SetHeaderValue "true" -Comments "<date> - <name> - Any mail that meets the conditions of this rule will go into the Inbox or Focused Inbox and not the Other view in Exchange Online"
Both Exchange Server Edge role and Exchange Online Protection have an attachment filtering policy. The default in Edge Server is quite long, and the default in EOP is quite short. There is also a few values that are common to both. So, how do you merge the lists so that your Edge Server attachment filtering policy is copied to Exchange Online in advance of changing your MX record to EOP? 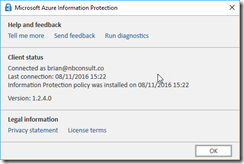 Azure Information Protection (AIP) is the new name, and new features for Azure Rights Management. 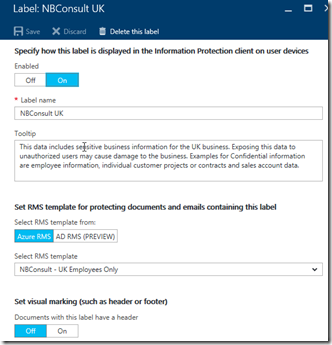 Azure Information Protection allows a company to create a series of labels to apply to documents and to have those documents tags and labelled. 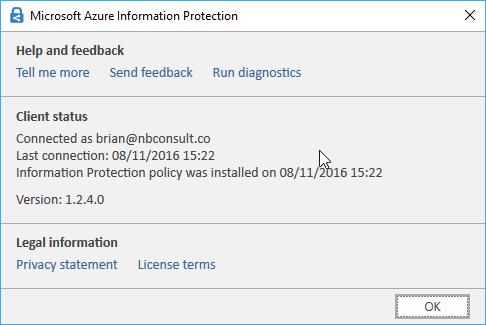 For example a watermark or header is easy to set in the Azure Information Protection management blade in portal.azure.com. In fact its so easy to turn on I did just that. The actual work and business consulting with Azure Information Protection is the why and business reasons for using it rather than the technical steps to enable it. 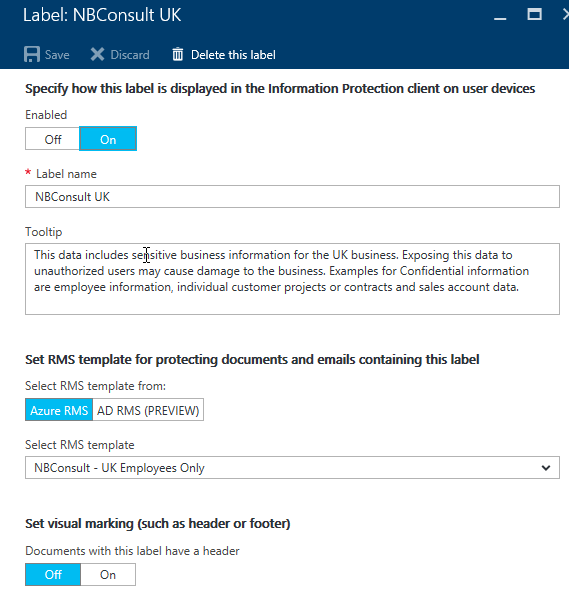 The above two graphics show one example label (Confidential) that has had a sub label added (called NBConsult UK). The larger image above shows the details for this “NBConsult UK” label. 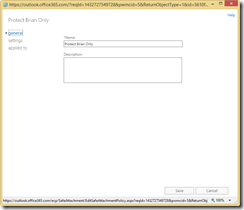 In the properties blade for the label you can see I have turned on a template from RMS. Once the changes are made and saved, you can publish the changes. Clients will pick up these changes on restarting the client application. And so I was finding my documents did not get the RMS based labels applied. This worked – I had the rights to use the template in the application – just AIP could not apply the template via the AIP tool. 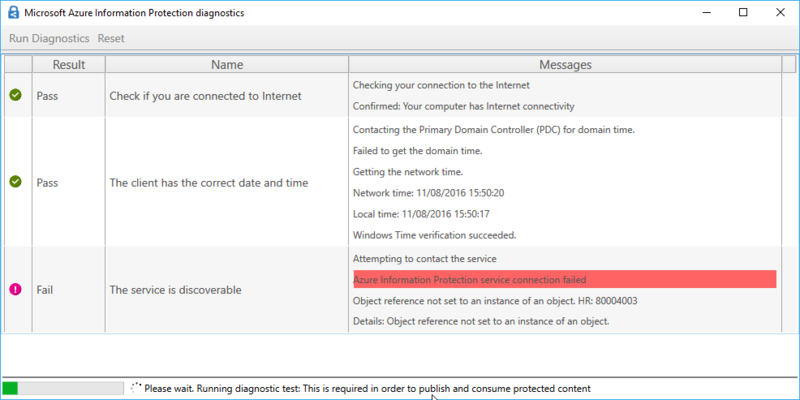 To get around this issue, as the reset option to fix the AIP application in the diagnostics tool was not available due to the application crash, I followed the steps in http://social.technet.microsoft.com/wiki/contents/articles/19251.ad-rms-troubleshooting-reset-the-client-msipc.aspx to bootstrap the client manually. If the AIP diag client completes, fix the listed issue or choose Reset in the client. Both of these PowerShell cmdlets need to be run in Exchange Online via Remote PowerShell. So the obvious next step (or obvious to me anyway) is to try the removal in remote PowerShell to Office 365. The cmdlet is Remove-MsolDomain -DomainName domain.com but this comes back with with messages that might be helpful, but after repeated running of the cmdlet and fixing the error still suggests the same fix. 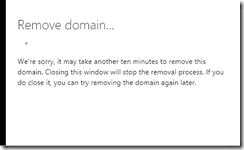 The error reads: Remove-MsolDomain : Unable to remove this domain. Use Get-MsolUser -DomainName <domain name> to retrieve a list of objects that are blocking removal. 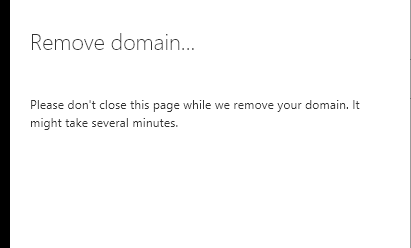 The problem with this error is the list of objects here are only user accounts and not any of the other objects that could block a domain removal. So sure, remove your unneeded users or change their UPN/email address to not include this domain that you want to remove, but also run Get-MsolContact and Get-MsolGroup and then remove or edit the contacts and the groups that use this domain. 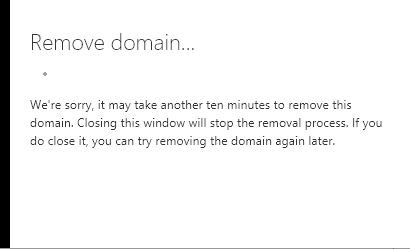 So though the error says to fix the user objects that are blocking domain removal, you also need to fix or remove the groups and contacts as well. In a recent project I was working with iQ.Suite from GBS and specifically the component of this software that add signatures to emails. The client are an international organization with users in different geographies and we needed to accommodate the users qualifications in their email signature. The problem with this is that in Germany qualifications are written in front of the name and in the USA at the end and in other countries at the start and the end. We were doing a Notes to Exchange migration and in Notes the iQ.Suite signature software read data from Notes that was originally pulled from Active Directory, and so the client had placed the qualifications in the DisplayName field in the Active Directory. But when we migrated to Exchange Server the Global Address List listed the users DisplayName an so the German users where all listed together with “Dipl” as the first characters of their name. Also the name the email came from was written like this. The signature worked, but the other changes that became apparent meant we had to work out a different way to look at this problem. In iQ.Suite we created a signature that looked like the following. This has a conditional [COND] entry for personalTitle, displayName and generationQualifier. That is if each of these are present, then show the displayName with personalTitle before it and generationQualifier after it. If the user does not have values for these fields, do not show them. The [COND] control is documented in iQ.Suite. What was not so well documented, and why I wanted to write this blog entry was that the personalTitle and generationQualifier attributes are not stored in the Global Catalog and so are missing in the users signature. In the multi-domain deployment we had at the client, iQ.Suite read the personalTitle, displayName and generationQualifier Active Directory attributes from the Global Catalog as Exchange was installed in a resource domain and the users in separate domains and so unless the attribute was pushed to the Global Catalog it was not seen by iQ.Suite. To promote an attribute to be visible in the Global Catalog you need to open the Schema Management MMC snap-in, find the attributes of question and tick the Replicate this attribute to the Global Catalog field. 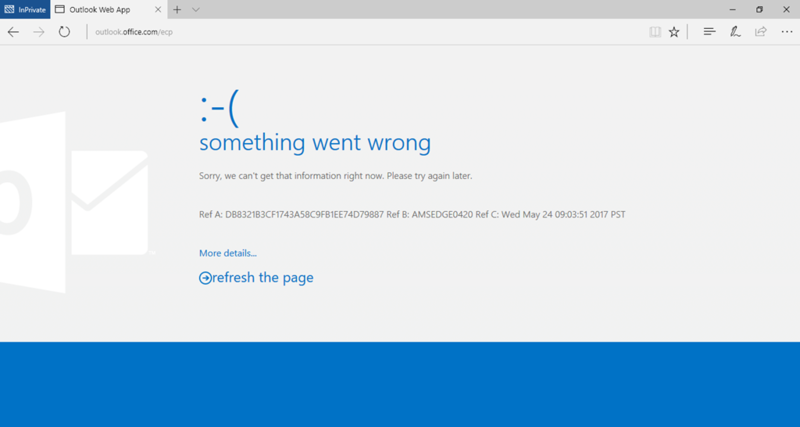 This is outlined in https://technet.microsoft.com/en-us/library/cc737521(v=ws.10).aspx. I had been struggling with password writeback testing and was coming across the following set of errors, and found that searching for them uncovered nothing online. So I wrote this blog to remind me and help you solve these issues. 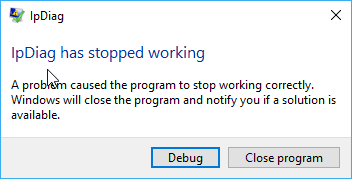 These errors are all visible in the Application log of the Event Viewer. EventID 33004: TrackingId: 7344da2c-ab9d-42ef-adea-4a17d07fdeb9, Reason: Synchronization Engine returned an error hr=80230626, message=The password could not be updated because the management agent credentials were denied access., Context: cloudAnchor: User_9b83f544-ba22-4ffb-bff5-c1c2374d654c, SourceAnchorValue: F39SWQrM2EidaboN8UC8Ww==, UserPrincipalName: ethan@contoso.co.uk, Details: Microsoft.CredentialManagement.OnPremisesPasswordReset.Shared.PasswordResetException: Synchronization Engine returned an error hr=80230626, message=The password could not be updated because the management agent credentials were denied access. 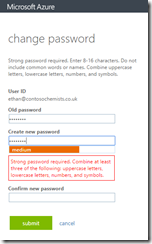 Event ID 6329: An unexpected error has occurred during a password set operation. Event ID 33008: TrackingId: 3c8c78dc-9167-4286-9384-e2f0e777af87, Reason: Synchronization Engine returned an error hr=80230619, message=A restriction prevents the password from being changed to the current one specified., Context: cloudAnchor: User_9b83f544-ba22-4ffb-bff5-c1c2374d654c, SourceAnchorValue: F39SWQrM2EidaboN8UC8Ww==, UserPrincipalName: ethan@contoso.co.uk, Details: Microsoft.CredentialManagement.OnPremisesPasswordReset.Shared.PasswordResetException: Synchronization Engine returned an error hr=80230619, message=A restriction prevents the password from being changed to the current one specified. 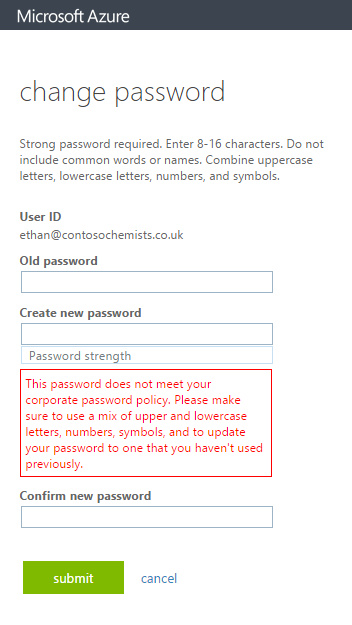 This of course seems self explanatory – your password is not complex enough for your rules on-premises but complex enough to get past the Azure initial checks that it imposes. This error though is especially annoying in test scenarios where you have turned off all the complexity checks. 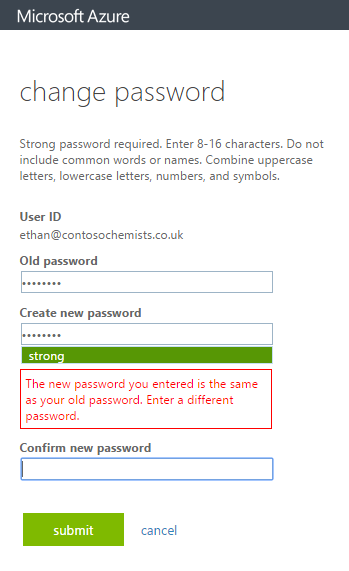 To test why you are getting this error, first check its a password change error and not something else, and try and change the users password on-premises. You should get the same restriction. Then use the cmd prompt to check the password settings for the user. But the domain controller (after running gpupdate to force the change to the domain controller) still enforces a single day to allow the change to occur. 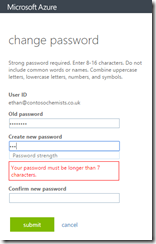 Now you should be able to change your password in Azure against an on-premises user. 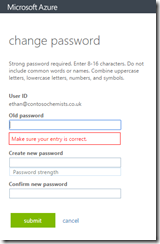 In the password change portal, the user is required to enter a strong password regardless of any restrictions that you have on-premises. 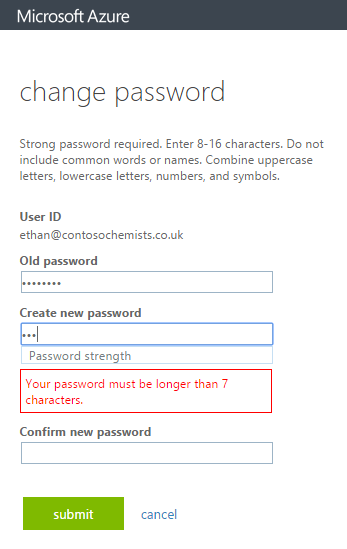 So even if you are testing and have removed all history and complex and renewal requirements for the password, Azure will ensure that a strong password of 7 or more characters is entered regardless of your on-premises policy. In fact, Azure does not know your on-premises policy for password restrictions and enforces its own in addition to the one you have. Azure Active Directory has been long the read-only cousin of Active Directory for those Office 365 and Azure users who sync their directory from Active Directory to Azure Active Directory apart from eight attributes for Exchange Server hybrid mode. Not any more. 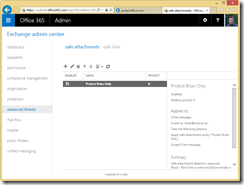 Azure Active Directory writeback is now available. This enables objects to be mastered or changed in Azure Active Directory and written back to on-premises Active Directory. 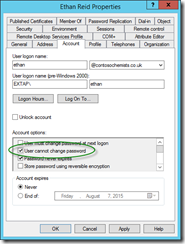 Users can change their passwords via the login page or user settings in Office 365 and have that password written back online. Exchange Server hybrid writeback is the classic writeback from Azure AD and is the apart from Group Writeback is the only one of these writebacks that does not require Azure AD Premium licences. All of these features require AADConnect and not and of the earlier verions. You can add all these writeback functions from the AADConect setup wizard, and if you have used Custom mode, then you will need to implement the following permissions. In all the below sections you need to grant permission to the connector account. 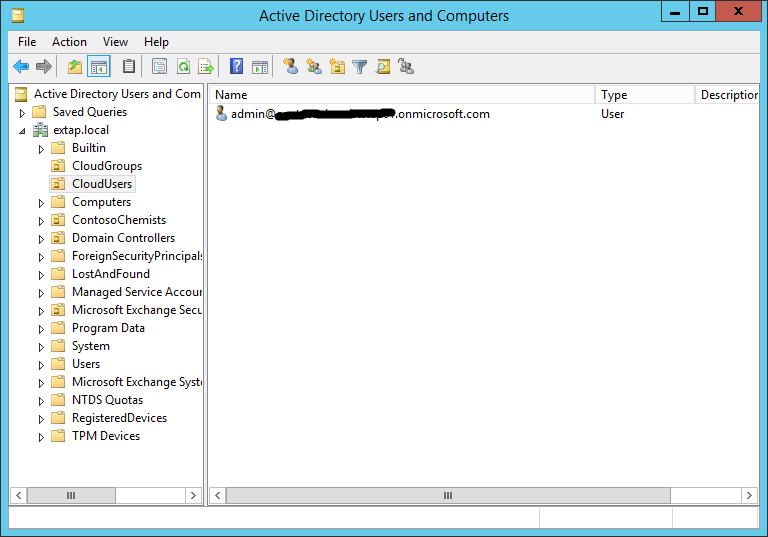 You can find the connector account for your Active Directory forest from the Synchronization Service program > Connectors > double-click your domain > select Connect to Active Directory Forest. 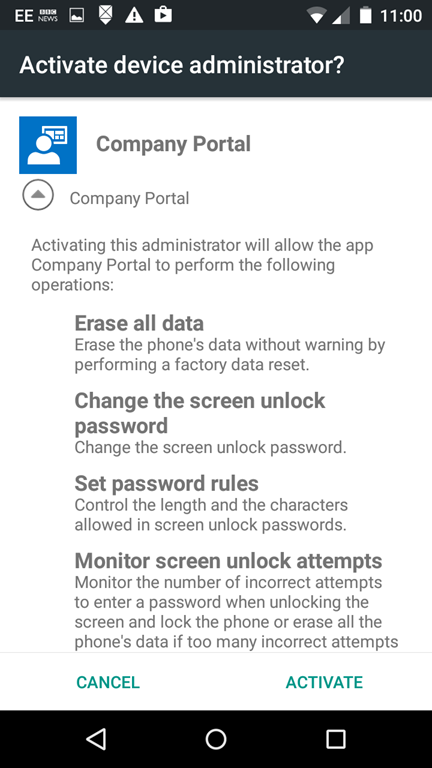 The account listed here is the connector account you need to grant permissions to. For users with (typically) multi-forest deployments or plans or a forest migration, the objectGuid value in Active Directory, which is used as the source for the attribute that keys your on-premises object to your synced cloud object – in AAD sync parlance, this is known as the SourceAnchor. If you set up AADConnect version 1.1.553.0 or later you can opt to change from objectGuid to a new source anchor attribute known as ms-ds-consistencyGuid. 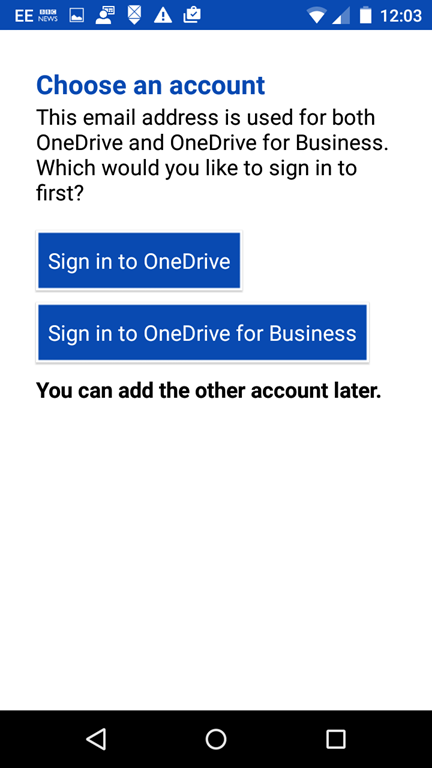 To be able to use this new feature you need the ability for AADConnect connector account to be able to read ObjectGUID and then write it back to ms-ds-consistencyGuid. The read permissions are typically available to the connector account without doing anything special, and if AADConnect is installed in Express Mode it will get the write permissions it needs, but as with the rest of this blog, if you are not using Express Mode you need to grant the permissions manually and so write permissions are needed to the ms-ds-consistencyGuid attribute. This can be done with this script. $accountName = "domain\aad_account" #[this is the account that will be used by Azure AD Connect Sync to manage objects in the directory, this is often an account in the form of MSOL_number or AAD_number]. $cmd = "dsacls '$ForestDN' /I:S /G '`"$accountName`":WP;ms-ds-consistencyGuid;user'"
Note that if you use ms-ds-consistencyGuid then there are changes required on your ADFS deployment as well. 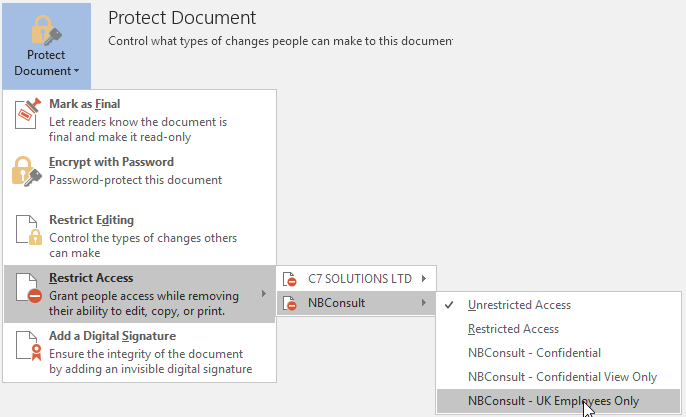 The Issuance Transform Rules for the Office 365 Relying Party Trust contains a rule that specifies the ImmutableID (aka AADConnect SourceAnchor) that the user will be identified as for login. By default this is set to ObjectGUID, and if you use AADConnect to set up ADFS for you then the application will update the rule. But if you set up ADFS yourself then you need to update the rule. 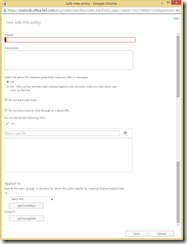 When Office 365 is configured to federate a domain (use ADFS for authentication of that domain and not Azure AD) then the following are the claims rules that exist out of the box need to be adjusted. This is to support the use of ms-ds-consistencyguid as the immutable ID. You get two or three rules listed here. You get three rules if you use -SupportMultipleDomain switch in Convert-MSOLDomainToFederated. 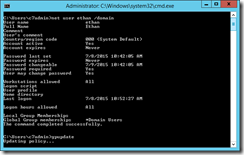 If you do not have a 2012 R2 or later domain controller then you need to update the schema of your forest. Do this by getting a Windows Server 2012 R2 ISO image and mounting it as a drive. Copy the support/adprep folder from this image or DVD to a 64 bit domain member in the same site as the Schema Master. Then run adprep /forestprep from an admin cmd prompt when logged in as a Schema Admin. The domain member needs to be a 64 bit domain joined machine for adprep.exe to run. Wait for the schema changes to replicate around the network. 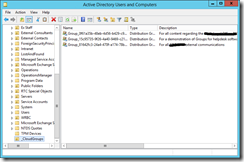 Import the cmdlets needed to configure your Active Directory for writeback by running Import-Module ‘C:\Program Files\Microsoft Azure Active Directory Connect\AdPrep\AdSyncPrep.psm1’ from an administrative PowerShell session. You need Azure AD Global Admin and Enterprise Admin permissions for Azure and local AD forest respectively. 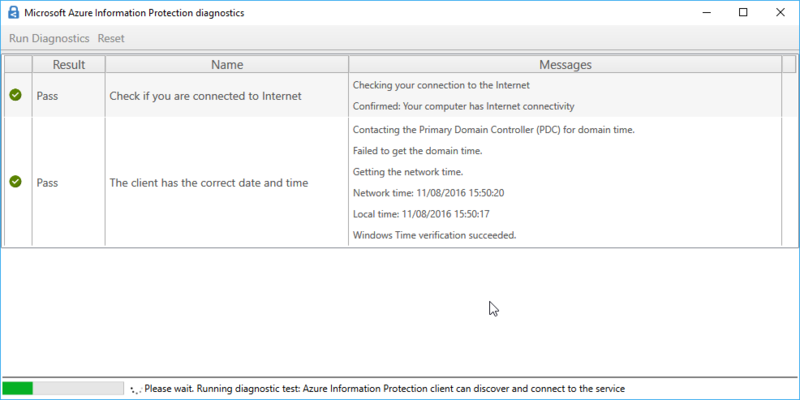 The cmdlets for this are obtained by running the Azure AD Connect tool. Initialize-ADSyncDeviceWriteBack -AdConnectorAccount $accountName -DomainName contoso.com #[domain where devices will be created]. 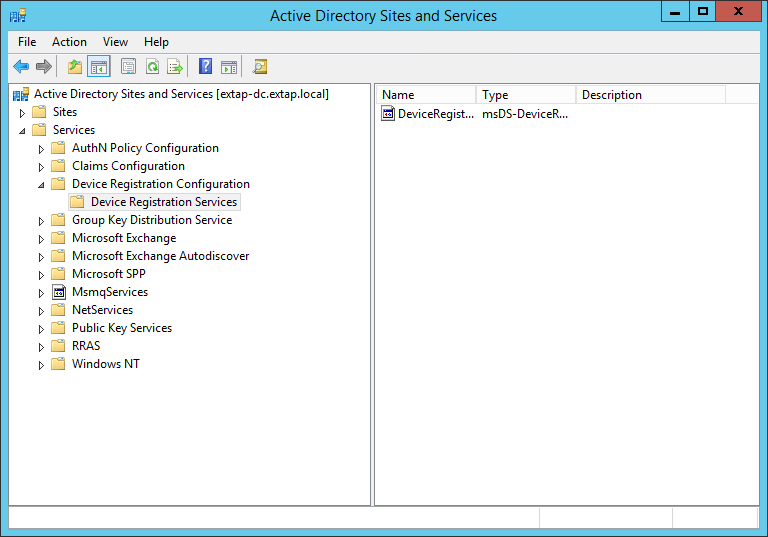 To see this, open Active Directory Sites and Services and from the View menu select Show Services Node. 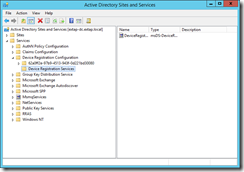 Also in the domain partition you should now see an OU called RegisteredDevices. The AADSync account now has permissions to write objects to this container as well. 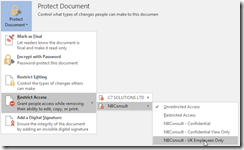 In Azure AD Connect, if you get the error “This feature is disabled because there is no eligible forest with appropriate permissions for device writeback” then you need to complete the steps in this section and click Previous in the AADConnect wizard to go back to the “Connect your directories” page and then you can click Next to return to the “Optional features” page. This time the Device Writeback option will not be greyed out. 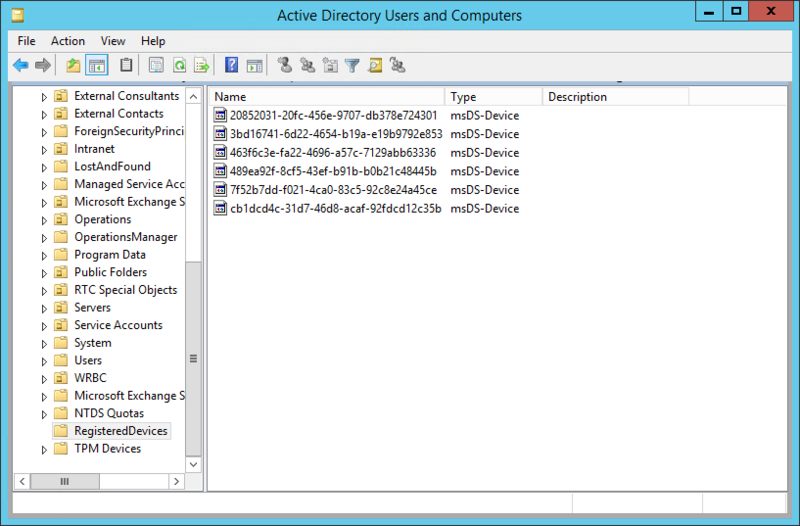 Not shown in the above, but adding the Display Name column in Active Directory Users and Computers tells you the device name. The registered owner and registered users of the device are available to view, but as they are SID values, they are not really readable. Writing Office 365 “Modern Groups” back to Active Directory on-premises requires Exchange Server 2013 CU8 or later schema updates and servers installed. 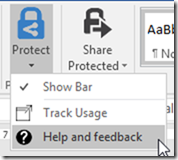 To create the OU and permissions required for Group Writeback you need to do the following. Import the cmdlets needed to configure your Active Directory for writeback by running Import-Module ‘C:\Program Files\Microsoft Azure Active Directory Connect\AdPrep\AdSyncPrep.psm1’ from an administrative PowerShell session. You need Domain Admin permissions for the domain in the local AD forest that you will write back groups to. The cmdlets for this are obtained by running the Azure AD Connect tool. Once these cmdlets are run the AADSync account will have permissions to write objects to this OU. 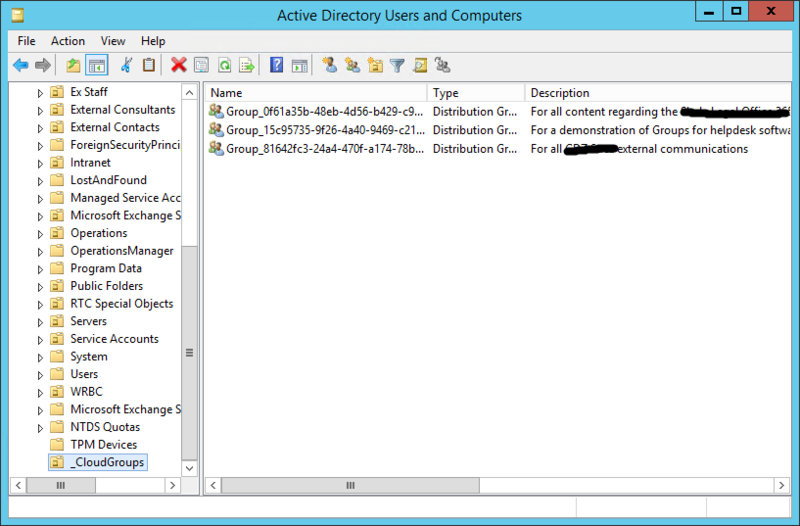 You can view the permissions in Active Directory Users and Computers for this OU if you enable Advanced mode in that program. There should be a permission entry for this account that is not inherited from the parent OU’s. 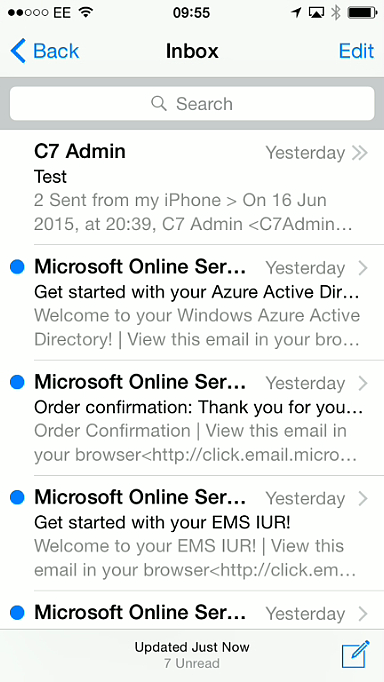 And you should find that on-premises users can send email to these groups as well. 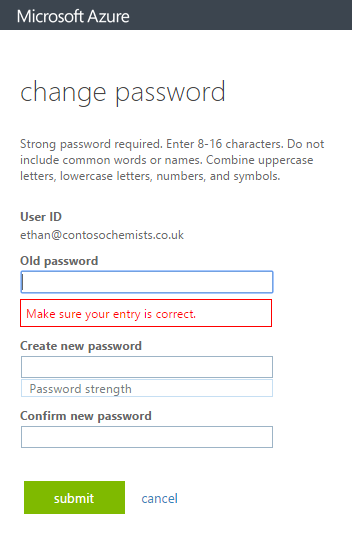 The option for users to change their passwords in the cloud and have then written back to on-premises (with multifactor authentication and proof of right to change the password) is also available in Office 365 / Azure AD with the Premium Azure Active Directory or Enterprise Mobility Pack licence. Get-ADSyncAADPasswordResetConfiguration -Connector "contoso.onmicrosoft.com - AAD"
The first of these cmdlets lists the ADSync connectors and the name and password reset state of the connector. You need the name of the AAD connector. The middle cmdlet tells you the state of password writeback on that connector and the last cmdlet enables it if needed. The name of the connector is required in these last two cmdlets. $cmd = "dsacls.exe '$passwordOU' /I:S /G '`"$accountName`":CA;`"Reset Password`";user'"
$cmd = "dsacls.exe '$passwordOU' /I:S /G '`"$accountName`":CA;`"Change Password`";user'"
$cmd = "dsacls.exe '$passwordOU' /I:S /G '`"$accountName`":WP;lockoutTime;user'"
$cmd = "dsacls.exe '$passwordOU' /I:S /G '`"$accountName`":WP;pwdLastSet;user'"
Finally you need to run the above once per domain. Hybrid mode in Exchange Server requires the writing back on eight attributes from Azure AD to Active Directory. The list of attributes written back is found here. The following script will set these permissions for you in the OU you select (or as shown at the root of the domain). The DirSync tool used to do all this permissioning for you, but the AADSync tool does not. Therefore scripts such as this are required. This script sets lots of permissions on these eight attributes, but for clarify on running the script the output of the script is sent to Null. Remove the “| Out-Null” from the script to see the changes as they occur (the script also takes a lot longer to run). $cmd = "dsacls '$HybridOU' /I:S /G '`"$accountName`":WP;proxyAddresses;user'"
$cmd = "dsacls '$HybridOU' /I:S /G '`"$accountName`":WP;msExchUCVoiceMailSettings;user'"
$cmd = "dsacls '$HybridOU' /I:S /G '`"$accountName`":WP;msExchUserHoldPolicies;user'"
$cmd = "dsacls '$HybridOU' /I:S /G '`"$accountName`":WP;msExchArchiveStatus;user'"
$cmd = "dsacls '$HybridOU' /I:S /G '`"$accountName`":WP;msExchSafeSendersHash;user'"
$cmd = "dsacls '$HybridOU' /I:S /G '`"$accountName`":WP;msExchBlockedSendersHash;user'"
$cmd = "dsacls '$HybridOU' /I:S /G '`"$accountName`":WP;msExchSafeRecipientsHash;user'"
$cmd = "dsacls '$HybridOU' /I:S /G '`"$accountName`":WP;msDS-ExternalDirectoryObjectID;user'"
$cmd = "dsacls '$HybridOU' /I:S /G '`"$accountName`":WP;publicDelegates;user'"
$cmd = "dsacls '$HybridOU' /I:S /G '`"$accountName`":WP;msExchDelegateLinkList;user'"
$cmd = "dsacls '$HybridOU' /I:S /G '`"$accountName`":WP;proxyAddresses;iNetOrgPerson'"
$cmd = "dsacls '$HybridOU' /I:S /G '`"$accountName`":WP;msExchUCVoiceMailSettings;iNetOrgPerson'"
$cmd = "dsacls '$HybridOU' /I:S /G '`"$accountName`":WP;msExchUserHoldPolicies;iNetOrgPerson'"
$cmd = "dsacls '$HybridOU' /I:S /G '`"$accountName`":WP;msExchArchiveStatus;iNetOrgPerson'"
$cmd = "dsacls '$HybridOU' /I:S /G '`"$accountName`":WP;msExchSafeSendersHash;iNetOrgPerson'"
$cmd = "dsacls '$HybridOU' /I:S /G '`"$accountName`":WP;msExchBlockedSendersHash;iNetOrgPerson'"
$cmd = "dsacls '$HybridOU' /I:S /G '`"$accountName`":WP;msExchSafeRecipientsHash;iNetOrgPerson'"
$cmd = "dsacls '$HybridOU' /I:S /G '`"$accountName`":WP;msDS-ExternalDirectoryObjectID;iNetOrgPerson'"
$cmd = "dsacls '$HybridOU' /I:S /G '`"$accountName`":WP;publicDelegates;iNetOrgPerson'"
$cmd = "dsacls '$HybridOU' /I:S /G '`"$accountName`":WP;msExchDelegateLinkList;iNetOrgPerson'"
$cmd = "dsacls '$HybridOU' /I:S /G '`"$accountName`":WP;proxyAddresses;group'"
$cmd = "dsacls '$HybridOU' /I:S /G '`"$accountName`":WP;proxyAddresses;contact'"
Currently in preview at the time of writing, you are able to make users in Azure Active Directory (cloud users as Office 365 would call them) and write them back to on-premises Active Directory. 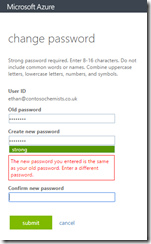 The users password is not written back and so needs changing before the user can login on-premises. To prepare the on-premises Active Directory to writeback user objects you need to run this script. This is contained in AdSyncPrep.psm1 and that is installed as part of Azure AD Connect. Azure AD Connect will install Azure AD Sync, which is needed to do the writeback. To load the AdSyncPrep.psm1 module into PowerShell run Import-Module ‘C:\Program Files\Microsoft Azure Active Directory Connect\AdPrep\AdSyncPrep.psm1’ from an administrative PowerShell session. $accountName = "domain\aad_account" #[this is the account that will be used by Azure AD Connect Sync to manage objects in the directory, this is an account usually in the form of AAD_number]. $cmd = "dsacls.exe '$DomainDN' /G '`"$accountName`":CA;`"Replicating Directory Changes`";'"
$cmd = "dsacls.exe '$DomainDN' /G '`"$accountName`":CA;`"Replicating Directory Changes All`";'"
CD "C:\Program Files\Microsoft Azure Active Directory Connect\AdPrep"
To successfully run these cmdlets you need to have the latest version of the Microsoft Online PowerShell modules installed (the V1.1 versions, not the V2.0 preview). You can get these from https://www.powershellgallery.com/packages/MSOnline (which in turn needs MSOL Signin Assistant from https://www.microsoft.com/en-us/download/details.aspx?id=41950 and the Windows Management Framework v5 from https://www.microsoft.com/en-us/download/details.aspx?id=50395). If you get errors in the above, make sure you have the correct version, download from above and try the scripts again. 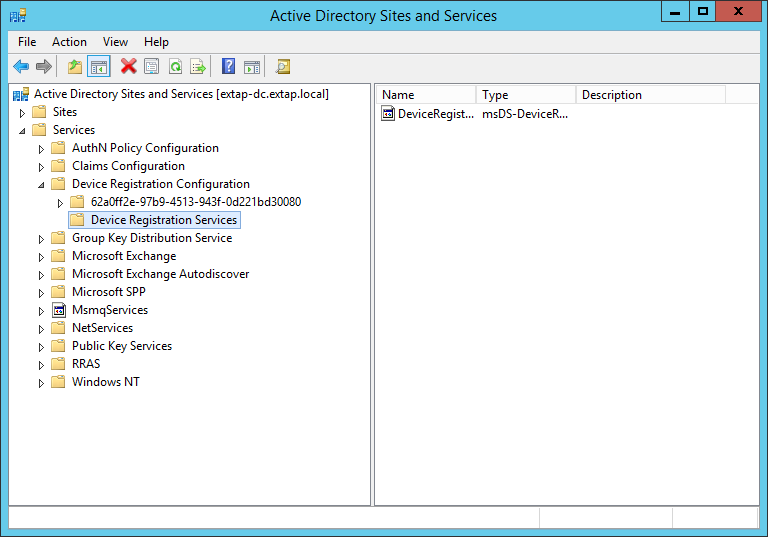 Once complete, open Active Directory Sites and Services and from the View menu Show Services Node. 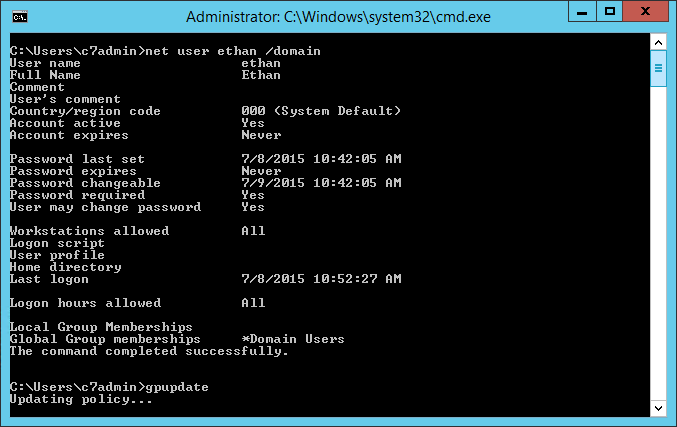 Then you should see the GUID of your domain under the Device Registration Configuration container. 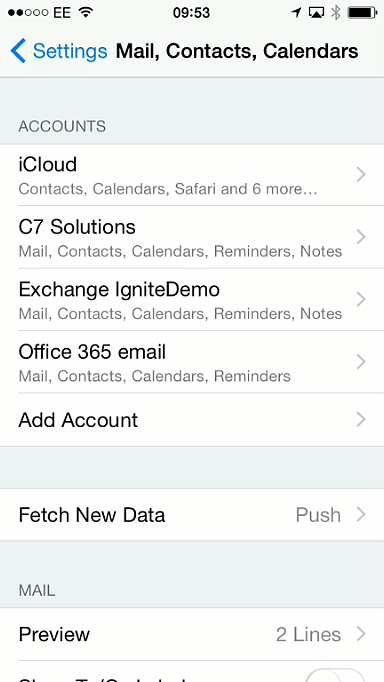 The following list of steps and screenshots are taken during the enrolment process to add an iPhone and an Android phone to Office 365 once the free MDM solution that comes with Office 365 is enabled for the user. 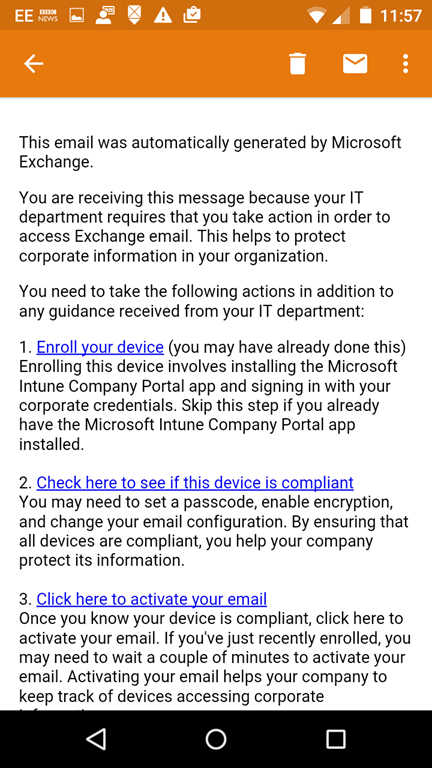 Once your IT Administrator enables MDM for your Office 365 account you will get the following email on your device if you already have email configured. It may take 24 hours from the admin configuring MDM for this to arrive. 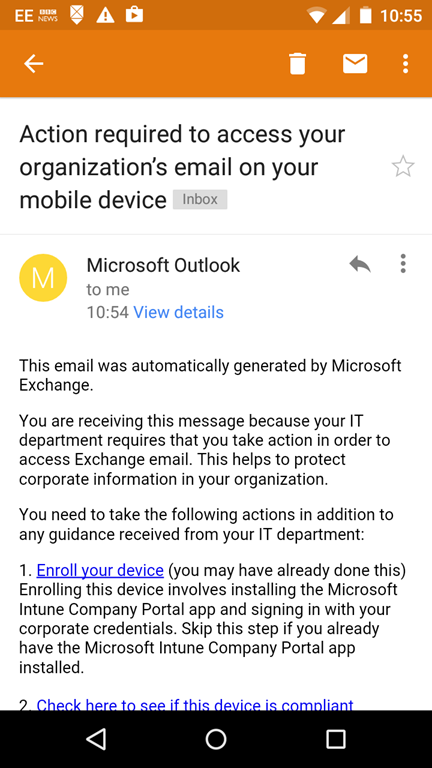 Once this email arrives no further email will arrive from that account any device until the devices are enrolled with the company for management. 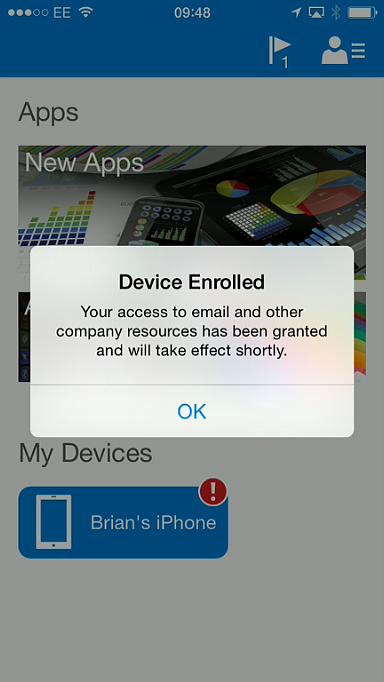 In the iOS example, the Company Portal app is already installed so we can click Open at the top. 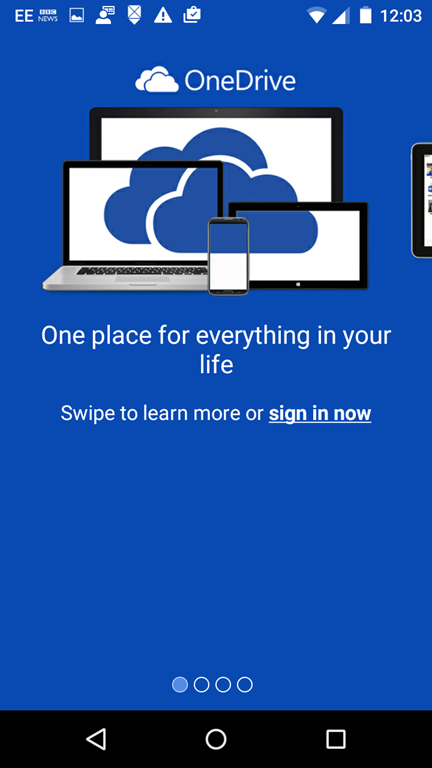 For Android to the right, it shows that the app needs installing from the page they see in the App Store. 3. 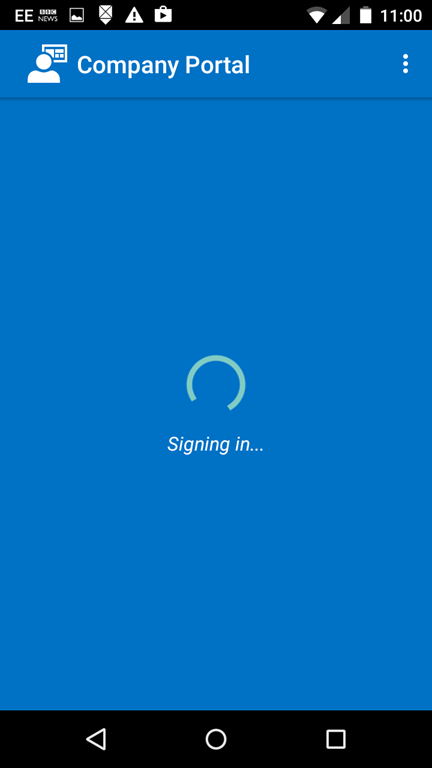 Once the app is installed you are required to login. 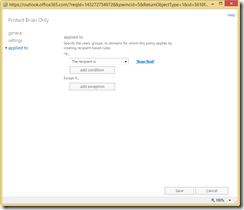 Enter your Office 365 username. Upon entering your username you will either be directed to your network to login (if your company uses AD FS to login) or you enter the password here. 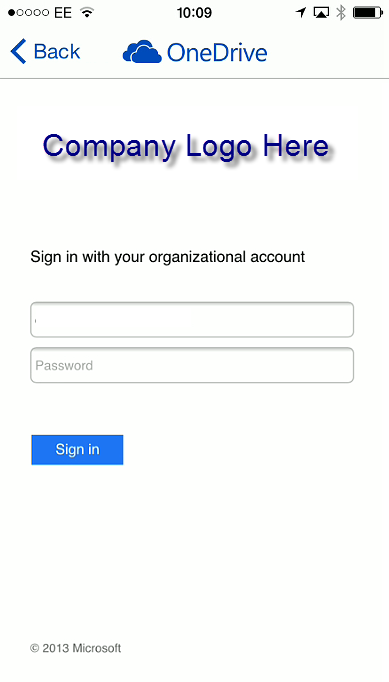 Step 4 shows the AD FS login page, which will probably have your company logo on it. 4. 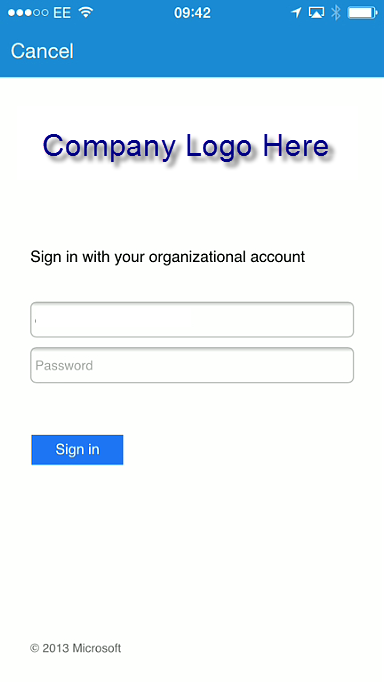 This is an example AD FS login page with company logo. If you are required to login with other information as well as your password you will be prompted for this as well. 5. 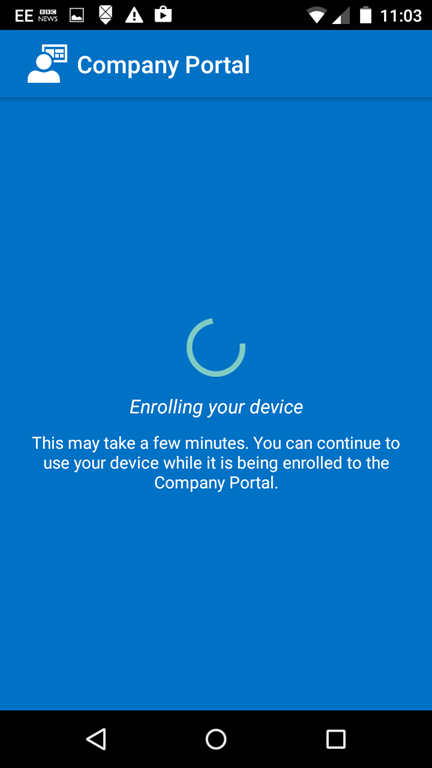 Upon login being successful your device will start the enrolment process by connecting to both Office 365 and the device manufacturer to download required secure management info. 6. For iOS click Enroll to start the process. For Android you need to click Activate. The company you are enrolling your phone into will have some rights over some of the data on your phone – for example they will be able to remove the work email account from it if you leave the company. 7. Enrolment goes through a series of steps with the screen changing a few times automatically. 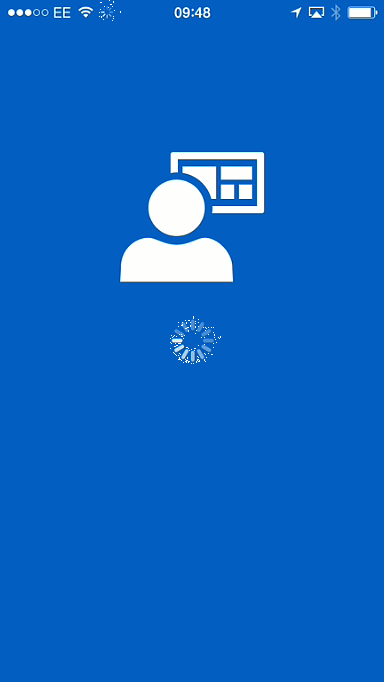 Within a seconds you end up at the “Install” screen. Click Install to add the management profile for the displayed company here. Android and Windows Phone have less steps to go through. 8. A unique encryption key is generated for your device when using iOS devices. 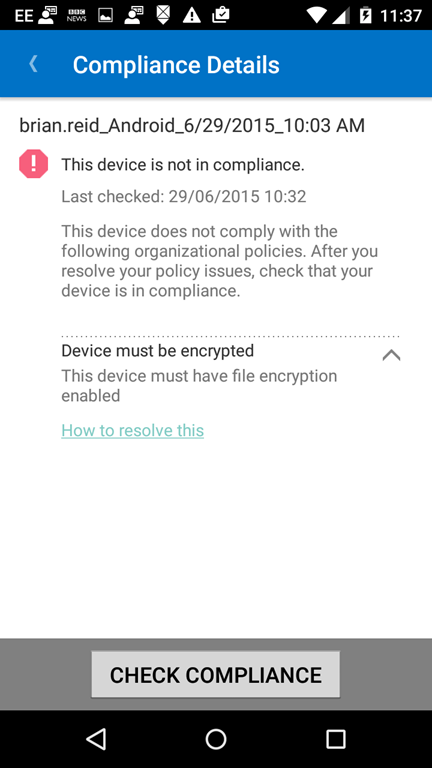 For Android, you need to accept the compliance requirements configured by your administrator. If you do not complete these requirements then business applications will not be available on the device. 9. 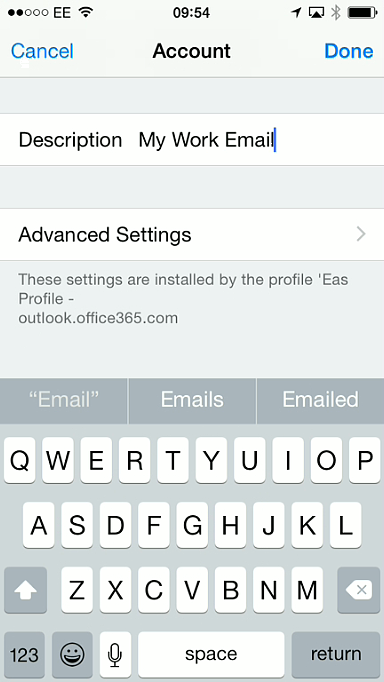 You need to click install at the personal settings screen when using iOS devices. 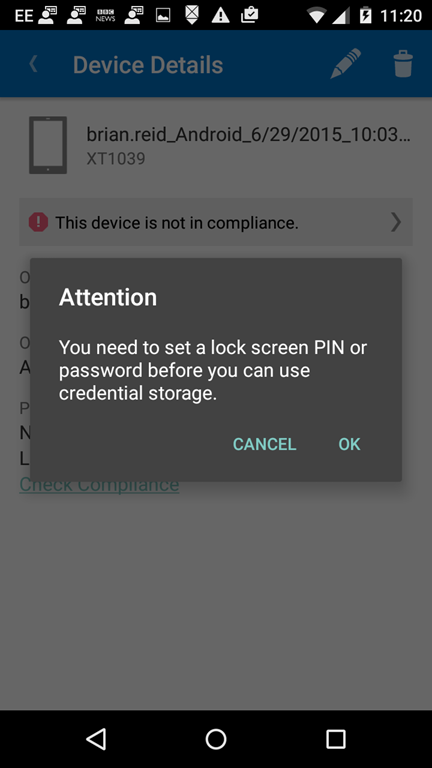 For Android, once compliance requirements are set (in this case a PIN number is entered). 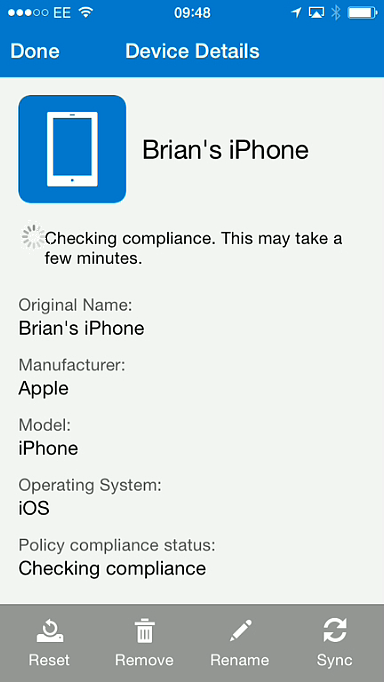 Note that for iOS, you have 1 hour to enter a PIN number to become compliant, but not for the Android. 10. 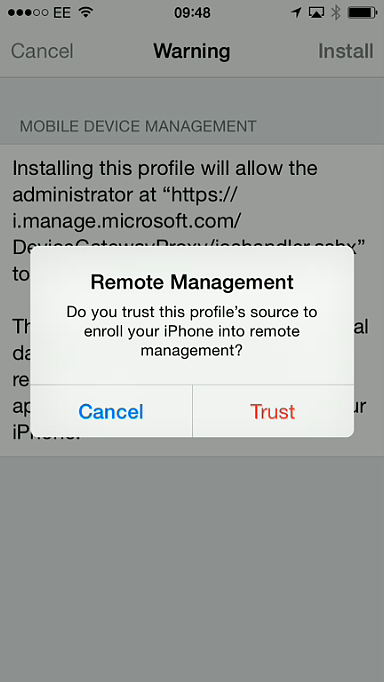 You need to confirm that you trust this company for remote management of your device when using iOS devices. 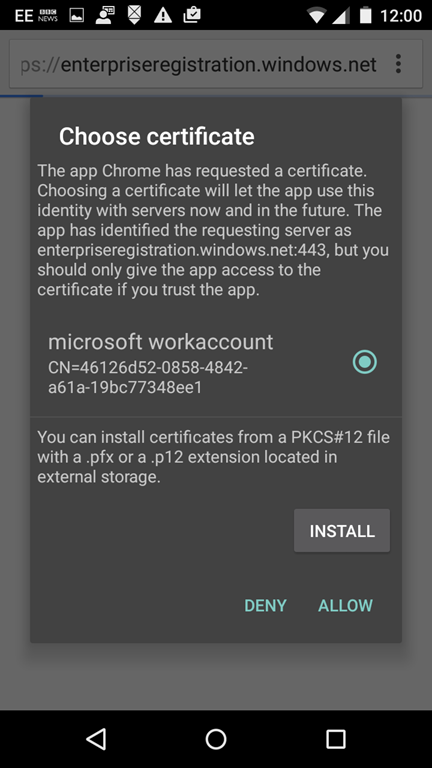 For Android you need to name and install the certificate. 11. 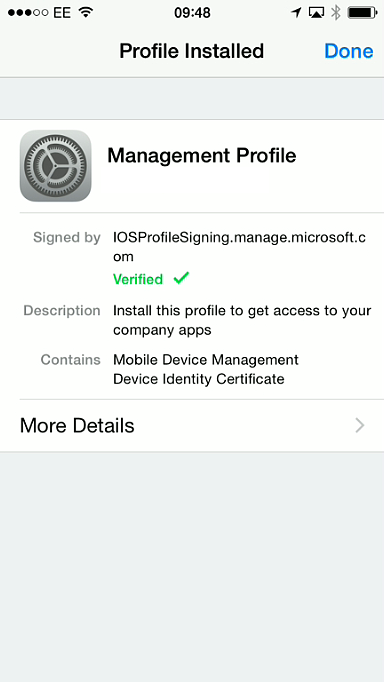 The management profile is installed and you can click Done when using iOS devices. 12. 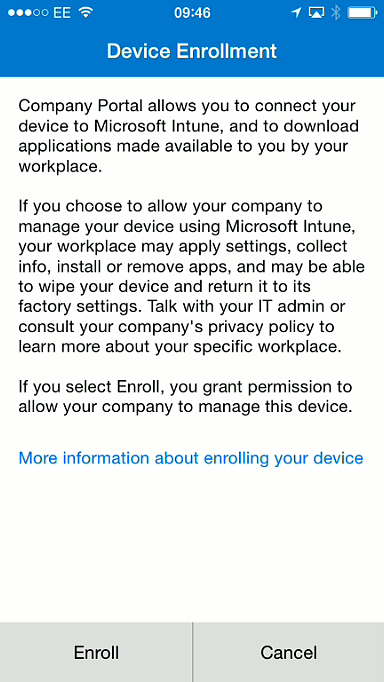 Device checks that it is enrolled and what the device settings are and if these settings are compatible with the companies required restrictions on the device. 13. Enrolment is confirmed. 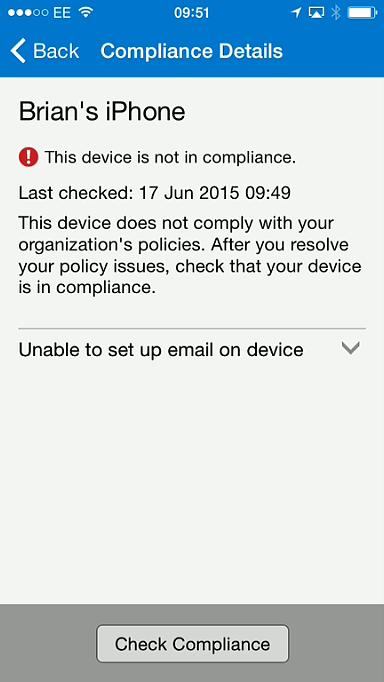 Notice that my device(s) are displayed and my current device is not compliant with company policy (the red exclamation mark). 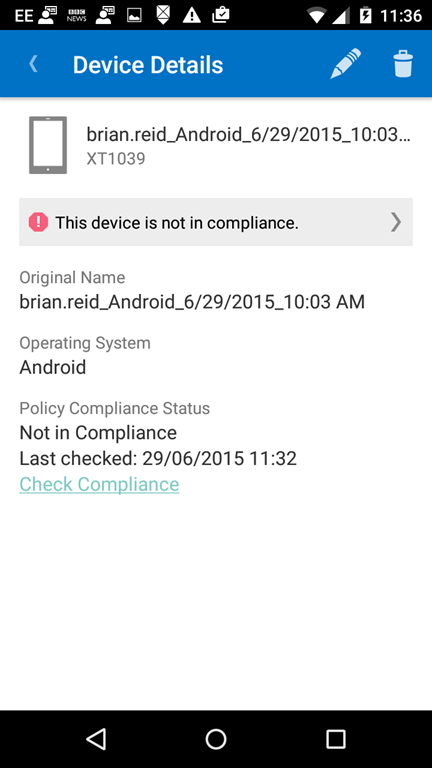 For Android devices, the My Devices tab will show your devices, including if there are any compliance issues. 15 And here the device is shown not to be compliant. 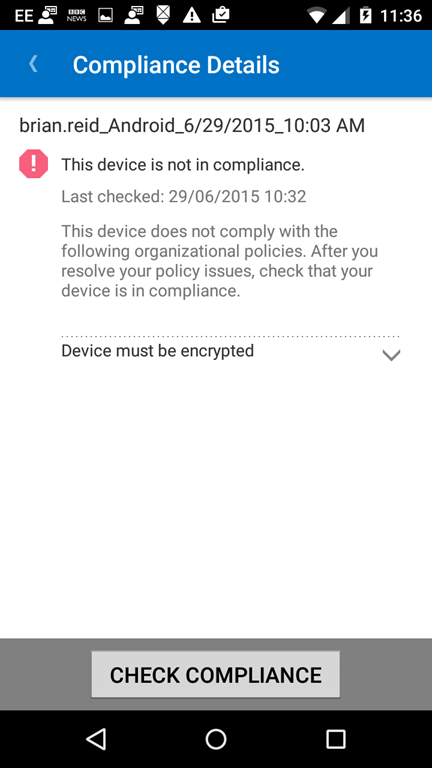 For Android devices not in compliance, it shows an Enrollment update available (if you did not meet compliance requirements during the Company App enrollment process) or if you are not compliance (for example device is not encrypted) then it will show that the device is not in compliance as shown. 16 Details on compliance state is iOS shows the “This device is not in compliance” message. 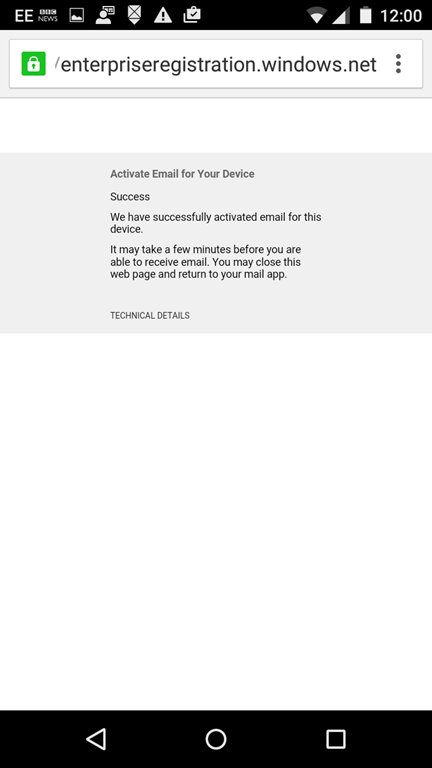 17 Clicking the “Unable to set up email on the device” message shows the full details. 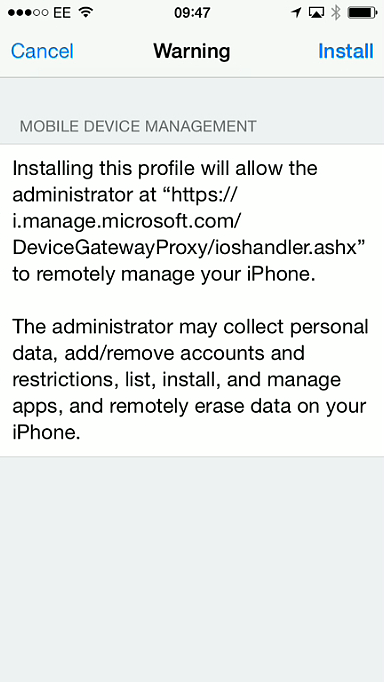 In this case the device already has an email profile configured and for the iPhone this needs to be removed and the Company Portal will recreate it. It is this recreated email profile that the iPhone/iPad can manage. Android and Windows Phone users do not need to delete their email profile and have the device recreate it but Compliance requirements must still be met. 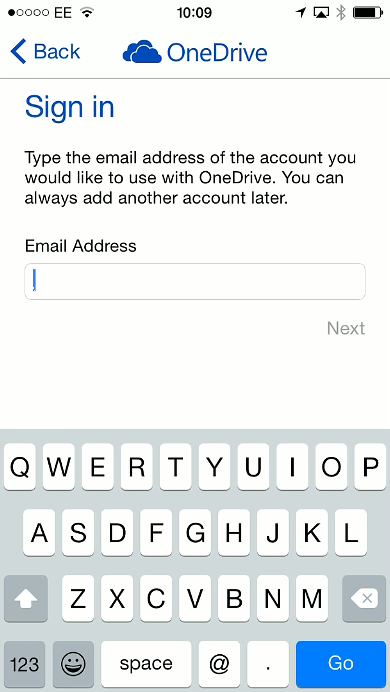 19 Once the account is deleted on the iOS device it is not visible in the list of email accounts. 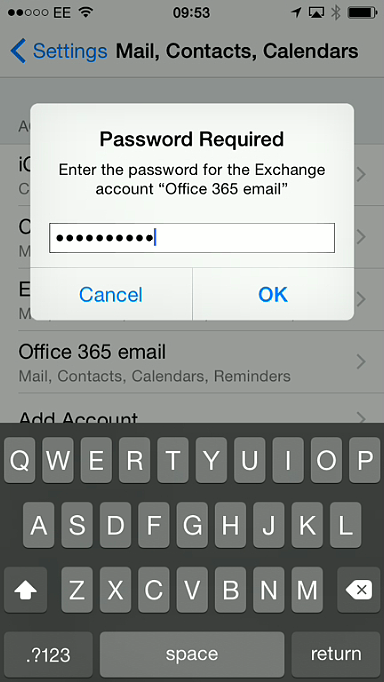 In this example the iCloud account remains along with two Exchange / Office 365 accounts that are not managed by MDM. 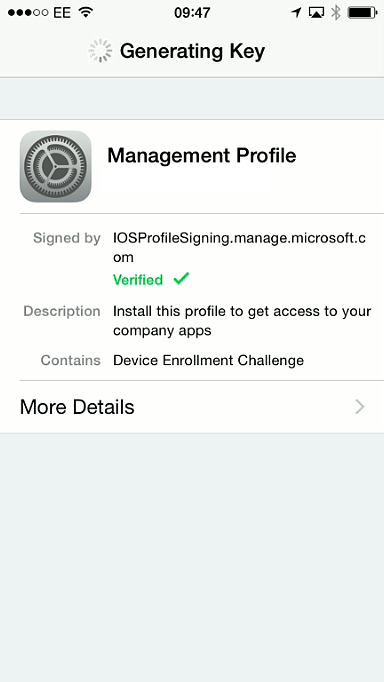 You can only have one MDM managed account per device at any given time. Other compliance settings may be required such as a PIN number. You have 60 minutes in iOS to enable this if required. 20 Once the Company App checks for compliance again and if you are compliant, a new email profile for your work appears. 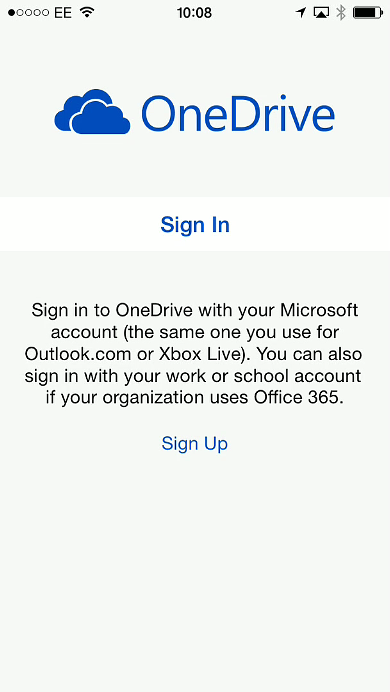 Clicking it (called “Office 365 email”) requires entry of your password. In Android, once the device is shown as compliant in #2 of the email, click the hyperlink for #3 in the email. Click Allow on the certificate prompt if you see one. 21 You then see the email profile created. Compare this to the image in Step 19 for the difference. An Android, you will be informed that your device has successfully authenticated for email. 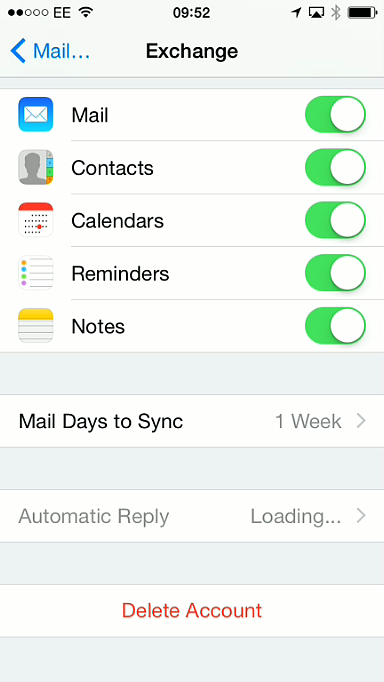 24 Email should now sync with your device again. 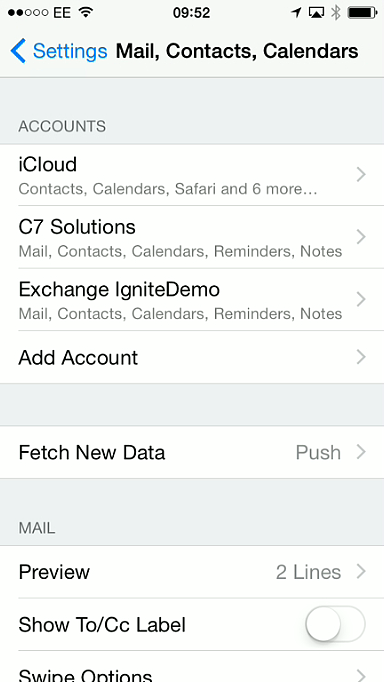 Notice that the email about needing to set up MDM is now missing and has been removed automatically. 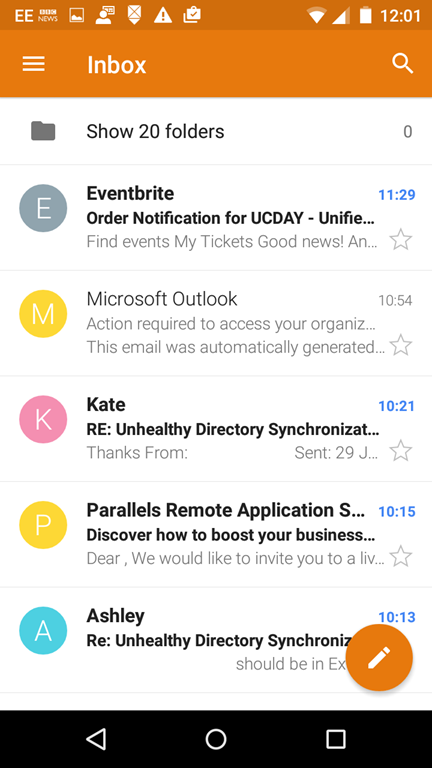 On the Android, drag the Inbox screen down to refresh it and your emails will appear. at Microsoft.Exchange.MailboxTransport.StoreDriverCommon.StorageExceptionHandler.RunUnderTableBasedExceptionHandler(IMessageConverter converter, StoreDriverDelegate workerFunction). The mailbox <guid> on database <database guid> is approaching its storage limit. A notification has been sent to the user. This warning will not be sent again for at least twenty four hours. The mailbox in both errors is the same and it occurs for mailboxes that have moved to Exchange Server 2013 from Exchange Server 2010 and are close to their mailbox quota. To fix the issue move the mailbox to a different database. The easiest way to do this is New-MoveRequest <guid> where the same GUID is used. If you have lots of these then this is a little more time consuming, unless you get PowerShell to the rescue. The following two cmdlets will query the last seven days of the event logs for MSexchangeIS sourced events with ID 1077, get the event log message (which contains the mailbox guid), manipulate the string containing the message and generate a text file of just the mailbox guids. The second cmdlet will run a New-MoveRequest for each mailbox listed in the text file. Make sure though that your Application event log is large enough to store more than seven days of events and then run these cmdlets, per server every seven days until the issue goes away (or over the course of say a year, move all mailboxes to different databases and that fixes it as well). 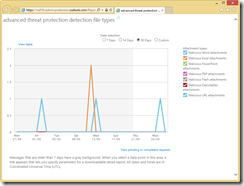 I discussed the newly released Advanced Threat Protection product in Office 365 on my blog, and in this article I want to outline the cmdlets that can be used to set this product up from Remote PowerShell to Office 365. To connect to Office 365 via PowerShell take a search on your favourite search engine – there are lots and lots of articles on doing this. 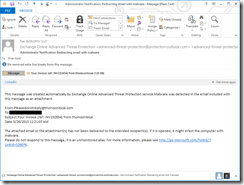 Once you have a connection to Exchange Online and you have purchased the Exchange Online Advanced Threat Protection product, you can use PowerShell to do your administration and report gathering. 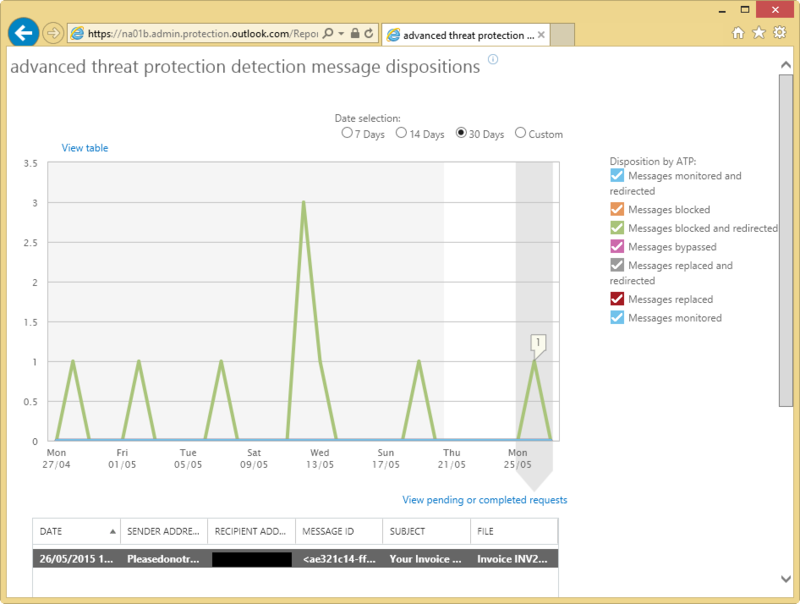 And for reporting, you can run Get-AdvancedThreatProtectionTrafficReport to report on the number of attachments blocked and the type of notification sent when looking at Safe Attachments. 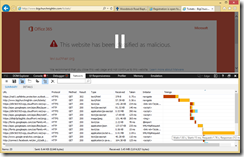 Get-UrlTrace does the same report for Safe Links. Note that the –SafeLinksPolicy value matches that of the name of the previously created policy when making the rule. The other cmdlets are self explanatory with regard to Enable- and Disable- and Set- and Remove-. 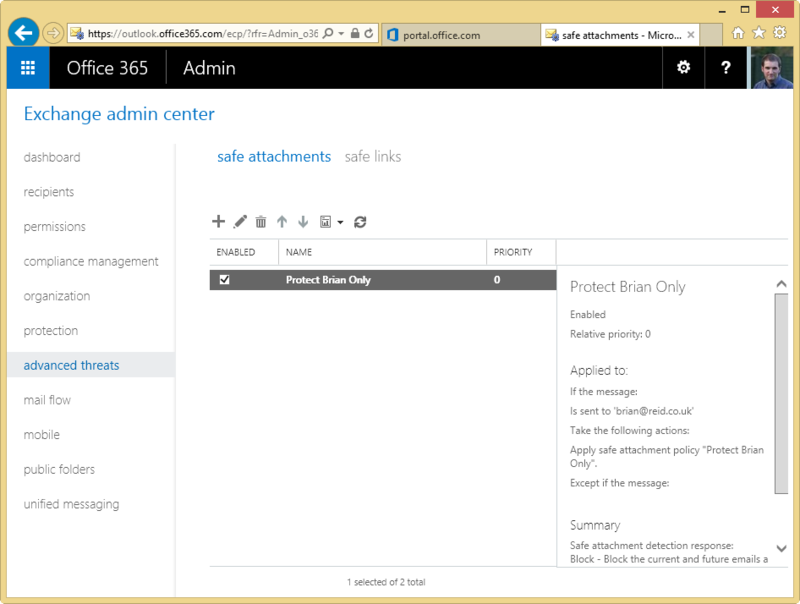 The advantage of using PowerShell to administer Safe Links and Safe Attachments is you can set up a policy in a lab and then copy it to a production environment or enable the same policy on many different tenants if you are a Microsoft Partner with customers interested in this advanced protection of their mailbox. 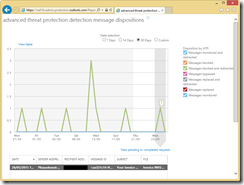 Announced a few months ago, Advanced Threat Protection became generally available on 1st June. I have been involved with trialling this product during the beta and so I thought I would note down a few thoughts on setting this up and what to expect now that it is publicly available. Advanced Threat Protection is an add-on product to Exchange Online/Exchange Online Protection with its own subscription, so you will not see these features and products unless you have subscribed. Once you have subscribed you will get two new features in the Exchange Control Panel for Office 365. These are the ability to find malware containing attachments before a detection signature for that malware exists (zero-day malware attacks) and the ability to filter all hyperlinks in email via a known malicious links service (filtering against spear-phishing attacks). The feature to detect zero-day malware is called Safe Attachments and the feature to protect against spear-phishing is known as Safe Links. 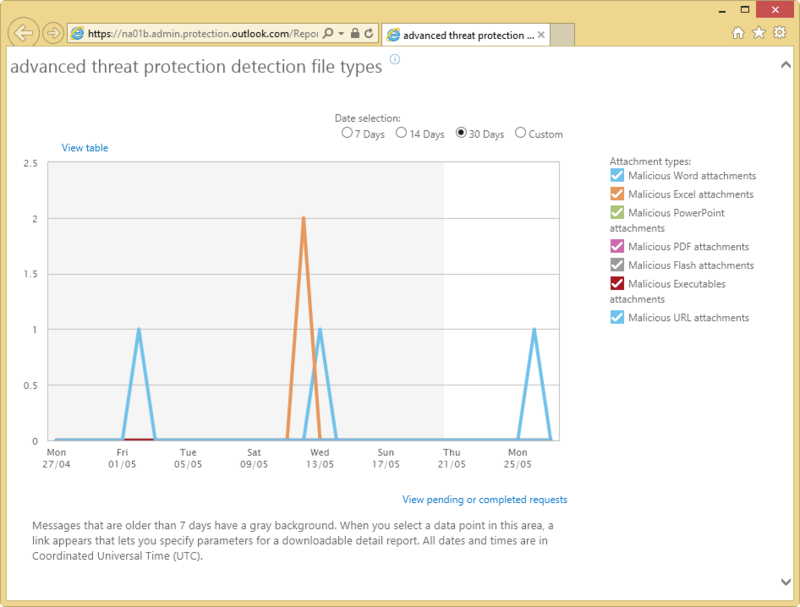 In the two screenshots above you can see that you have no Exchange Online Advanced Threat Protection licences purchased. To add Advanced Threat Protection licences click the Add more link and enter the number of licences you want to purchase. You do not need to purchases the same number of licences as EOP or Exchange Online mailbox licences as you use the policy below to control who Advanced Threat Protection is available for. Advanced Threat Protection for volume licence customers is available from August 2015 and for non-profit/educational licences from later in the year. Once the purchase is confirmed the Advanced Threat’s menu entry appears in the Exchange Administration Console. 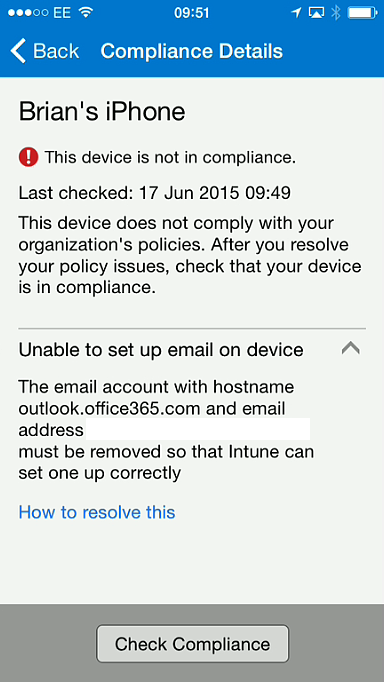 Also don’t forget to assign a licence to the appropriate users in the Office 365 portal. 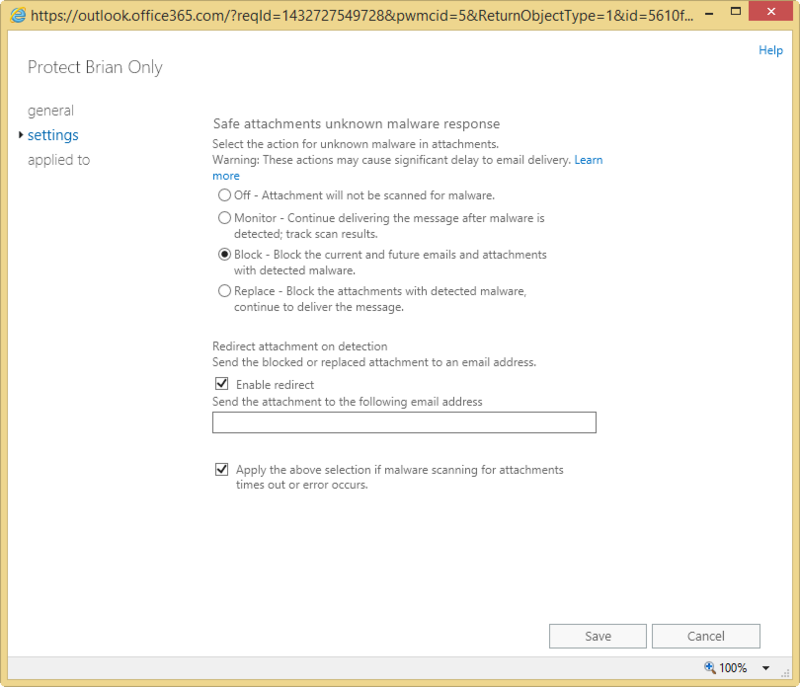 Safe Attachments in Advanced Threat Protection takes any email that meets the conditions of any one of the Safe Attachment policies that you create that also contains an attachment and checks this email for for malicious behaviour as it passes through Exchange Online Protection (EOP). 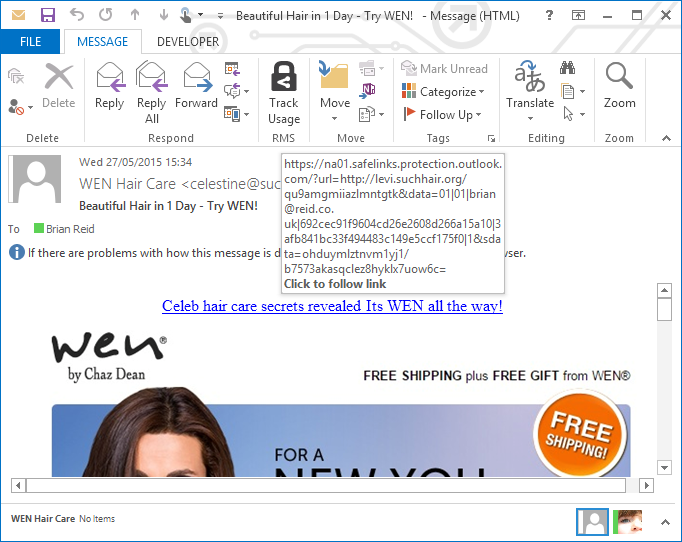 Before an email is checked by Safe Attachments the attachment has already been scanned for known malware and viruses. 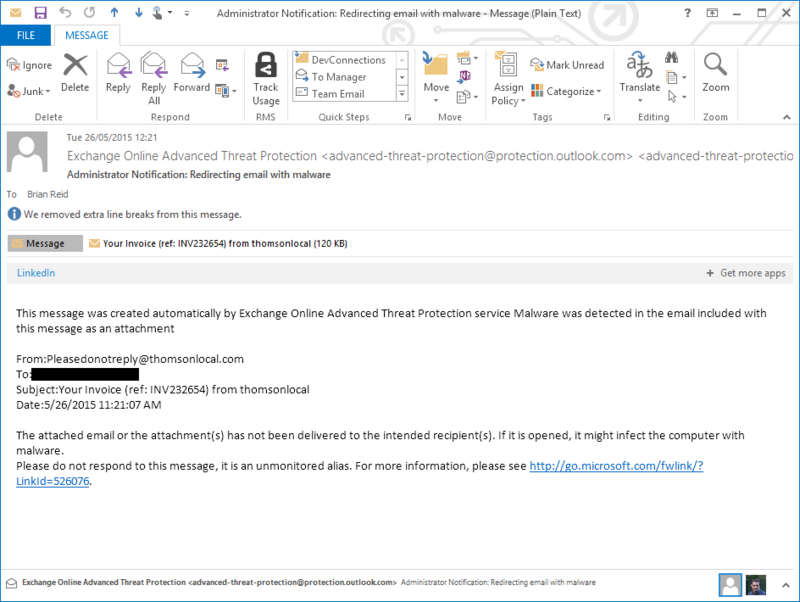 So if the attachment contains malware that was not detected by an existing AV signature or if it is a safe attachment (no malware) then the email is routed to the Safe Attachments component in EOP. If the email does not contain any attachments it is routed to the users mailbox by way of the other EOP spam filtering features. Once an email is considered to have cause to be checked by the Safe Attachments component of ATP the individual attachments in the message are placed inside a newly created Windows virtual machine that is spun up in ATP for the purposes of this service. 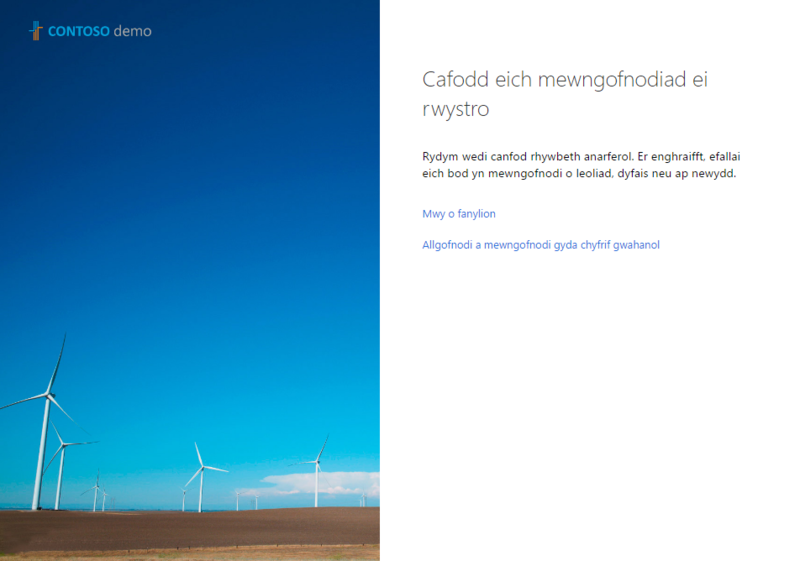 The attachment is then executed or otherwise run (for example if it is a Word doc, it is opened in Word in the new VM that was created for it). The VM is then watched for behaviour that is considered to be unsafe. Examples of unsafe behaviour include setting certain known registry key locations (such as the RunOnce group of keys in Windows) or downloading malicious content from the internet. 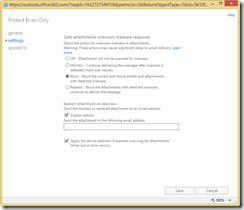 If the attachment does not exhibit that behaviour then the email is released and sent on to the user. If the email does exhibit these actions the email is not sent onward, and optionally a copy of the email in a form of a report is forwarded to an administrators mailbox (where care should be taken on opening the attachment). The time it takes to spin up a new VM and execute the attachment is in the region of 7 to 10 minutes. Therefore anyone subject to a Safe Attachments policy will have emails that contain attachments delayed by at least this amount of time. Of course this delay is necessary to ensure that the recipient is not being sent malware that is currently not detected (zero-day attacks) and the impact of this delay needs to be considered against the benefit of the additional filtering that happens and the impact of that user executing the malware themselves on their own machine. In the above screenshot I have a single policy created called “Protect Brian Only”. This would be an example where I wanted to protect those users whom I though where more likely to be subject to zero-day malware attacks – good examples would be highly targets accounts (CEO etc. ), IT administrator/help desk accounts and of course the accounts of users who will click anything and so you are often cleaning up their PC! There is no default policy, so unless a user is protected by a policy that you the administrator create, they are not subject to the Safe Attachments feature. As Advanced Threat Protection is an additional licence, only those users who are licenced should be included in any policy. The first page allows me to edit the name and description. The second page sets the policy (more on this below) and the final page sets who the policy applies to. 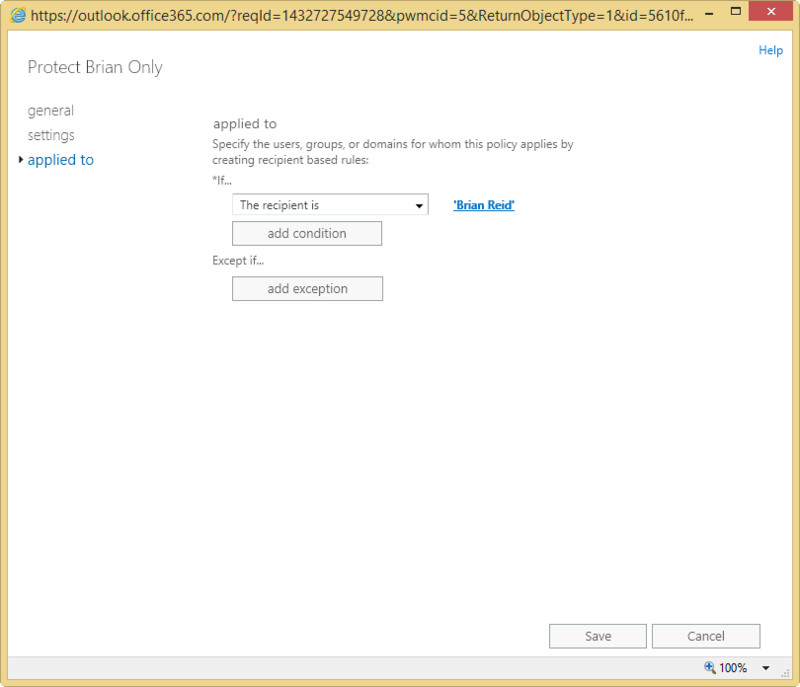 In this example it applies to a single recipient who was selected from the list of users in Office 365, though it could be a list of more than one user or anyone with a given email domain or anyone in an already created group. Scan attachment containing emails (with options to not do this scanning, scan and send onward to the user regardless of the result, block the emails containing bad attachments or replace the attachments with a notification but allow the contents of the email to go on through). Redirect the attachment containing emails to an alternative email address and what address to use. This is great for seeing what is blocked and acting as a sort of reporting service. 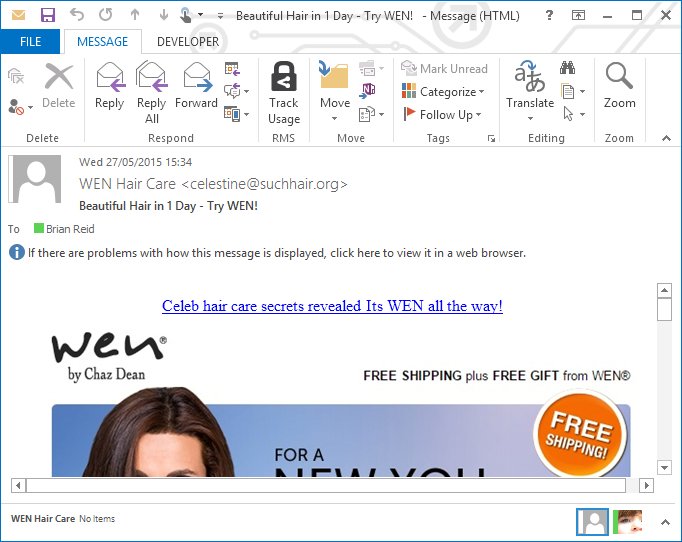 Warning – this email address will get malicious emails sent to it, handle with extreme care. Finally, in the event of a timeout at EOP/ATP where the attachment cannot be scanned in 30 minutes, check this box to treat the attachment in the same way as malicious emails are treated. This is the default action. In the mailbox of the intended recipient, if block or replace is selected in the policy then the user will not see the malicious attachment and therefore cannot accidently execute its contents. Here you see a report email that contains the email that was detected as malicious. You can see the To: address (redacted in the graphic above) and that it was not sent to the intended recipient and that it should not be opened. All in all, its a very simple and inexpensive way to protect the mailboxes of either all staff or those you consider subject to targeted malware such as CEO type staff and the IT department. 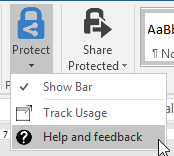 Even if you do not redirect emails containing malicious attachments, you can report on the number and type of attachments that are blocked from the reporting console available from the icon on the ATP toolbar. The following shows a 30 day report for my tenant (which has only a few live mailboxes protected). For data-points beyond 7 days old it will take a short while for the information on the report to be returned to you and you need to request that report from the provided link. For data-points under 7 days you can see the information in real-time. The grey background to report shows where the 7 day period is located. In the below screenshot the above malware can be see in the report as the single instance of an email that passed AV scanning successfully but was in fact a zero-day attack. 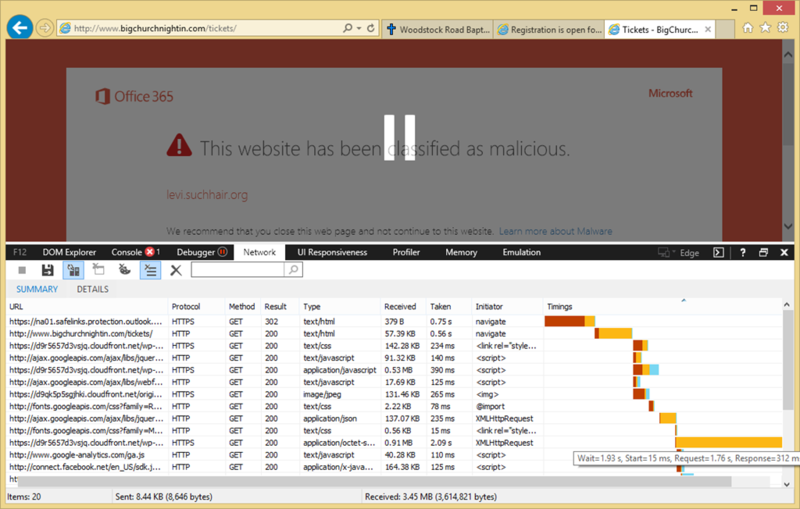 The second screenshot below shows the type of malware attachments that ATP is blocking. From this we can see that the risk lies in maliciously crafted Excel and Word attachments. When an email is delivered to the end recipient, any technology that checks the target of any link in the email is prone to one large issue – the web page or attachment on the other side of the hyperlink in the email may be safe and okay to view at the time of delivery, but might not be at the time the user comes to open the email and then click the link. Being aware of users working, or at least email reading hours, and delivering emails outside this timeframe with links to websites that are okay at the time of delivery means the email passes any web site or download checks done by the email server. Advanced Threat Protection’s Safe Links feature protects the user by rewriting the hyperlink in the email body so that the link is checked at the point of click and not the point of delivery. To do this the hyperlink is changed from the target to the Safe Links portal. Then when the user clicks the link, they are taken to the Safe Links portal and if the site is now on a block list, the user is blocked, but if the target of the link is fine they are sent a browser redirect to the original target. Note that this is not a proxy server – you do not connect to the target URL through the Safe Links portal, you just visit the Safe Links portal when you click the link and if the target is safe at point of click you are directed via your browser to the target (a client side redirect). If the target is not safe at point of click then an error page is displayed. Here I am told the page has been classified as malicious. I also have an option to continue anyway (and I can control if this setting appears for users or not) and an option to close the browser window. 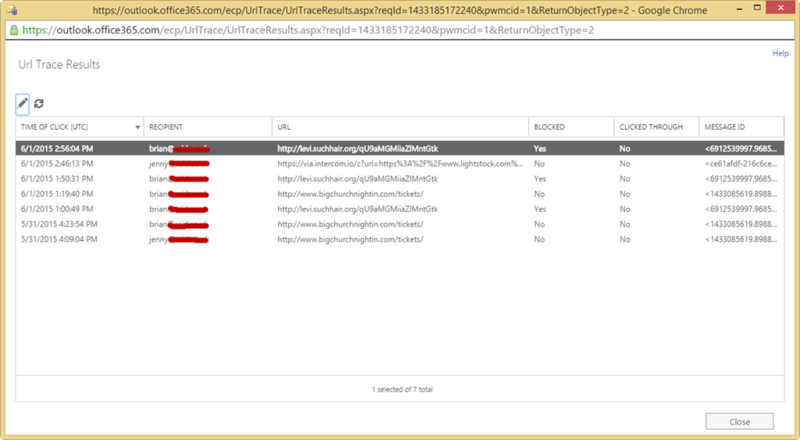 You will see that the first line is the Safe Links portal and this take 0.75 second before being redirected with a HTTP 302 client side redirect to the target URL and then the rest of the objects on the target page (until I paused the trace). So how do I set this all up? It is very similar to the Safe Attachments above in that we create a policy, and then any email that contains hyperlinks that is delivered to the end user after that users is added to a policy get rewritten. You can see from the screenshot that you need a name for the policy and whether or not a link is rewritten (policies with greater priority take precedence, so if a user is subject to two or more polices then only the higher priority policy takes effect, therefore you can use a policy to turn off link rewriting for a subset of users covered under a lower policy that enabled it for more users). Also you can disable link tracking and not to allow users to have the option to click through to the target URL. 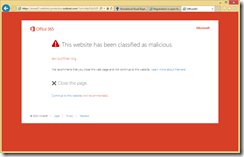 Link tracking allows you to report who clicked what link and not allowing users to click through disables the “Continue to this website (not recommended)” link on the Safe Links warning page. You also have the ability to control URL’s that you do not want to rewrite, and rewriting will only happen for FQDN URL’s (that is those with dots in them) and not single name URL’s such as http://intranet. This allows you to bypass redirection for sites you know are safe or are FQDN’s but are internal. Finally you get to set who the policy applies to. You do not need to apply the policy to all users if you have not licenced all users, but you can set policy based on who the recipient is, what domain the recipient is in (all users in that domain) or a group (some users). Announced during Microsoft Ignite 2015, there are now PowerShell administration cmdlets available for the administration of the Groups feature in Office 365. The cmdlets are all based around “UnifedGroups”, for example Get-UnifiedGroups. 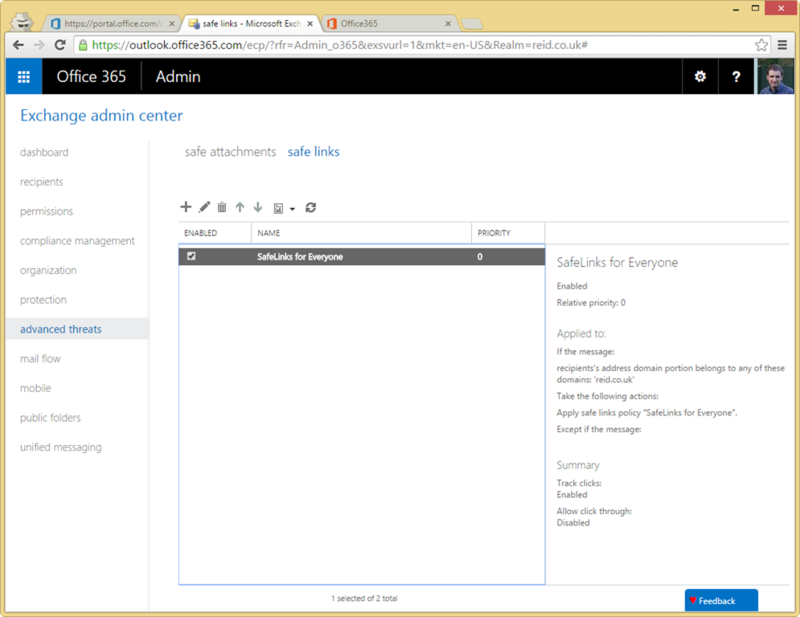 The use of the EmailAddress parameter is useful as it allows you to set a group that is not given an email address based on your default domain, but from one of the other domains in your Office 365 tenant. Use Set-UnifiedGroup to change settings such as the ability to receive emails from outside the tenant (RequireSenderAuthenticationEnabled would be $false), limit email from a whitelist (AcceptMessagesOnlyFromSendersOrMembers) and other Exchange distribution list settings such as hidden from address lists, mail tips and the like. AutoSubscribeNewMembers can be used to tell the group to email all new messages to all new members, PrimarySmtpAddress to change the email address that the group sends from. This is the new Remove-UnifiedGroup cmdlet. You can also pipe in a user list from, for example a CSV file, to populate a group. This would read: Add-UnifiedGroupLinks sales -LinkType members -Links $users where $users = Get-Content username.csv would be run before it to populate the $users variable. The source of the variable can be anything done in PowerShell. For this use Remove-UnifiedGroupLinks and mention the group name, the LinkType (member, owner or subscriber) and the user or users to remove. Set-OWAMailboxPolicy is used to create a policy that is not allowed to create Groups and then users have that policy applied to them. For example Set-OWAMailboxPolicy “Students” –GroupCreationEnabled $false followed by Set-CASMailbox mary –OWAMailboxPolicy Students to stop the user “mary” creating groups. 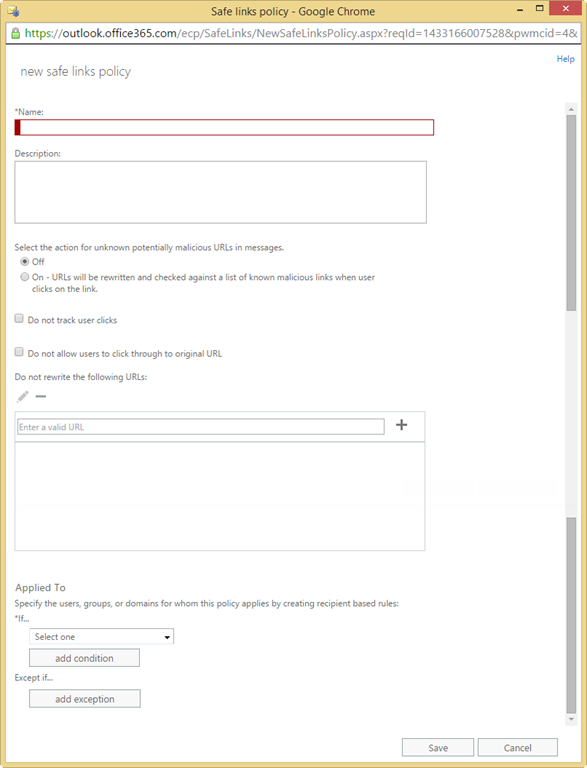 After the policy is assigned and propagates around the Office 365 service, the user can join and leave groups, but not create them. 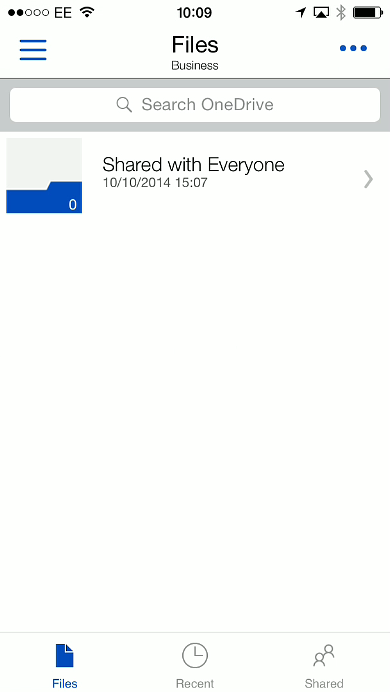 This feature allows you to control the group name or block words from being used. This is easier to set in the Distribution Groups settings in Exchange Control Panel rather than via PowerShell. 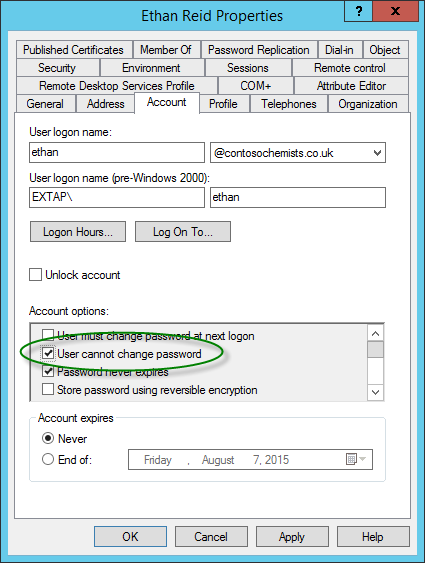 To do this EAC use Recipients > Groups and click the ellipses icon (…) and select Configure Group Naming Policy. This is the same policy for distribution groups. You can add static text to the start or end of name, as well as dynamic text such as region. Admins creating groups are not subject to this policy, but unlike DL’s if they create groups in PowerShell the policy is also not applied and so the -IgnoreNamingPolicy switch is not required. 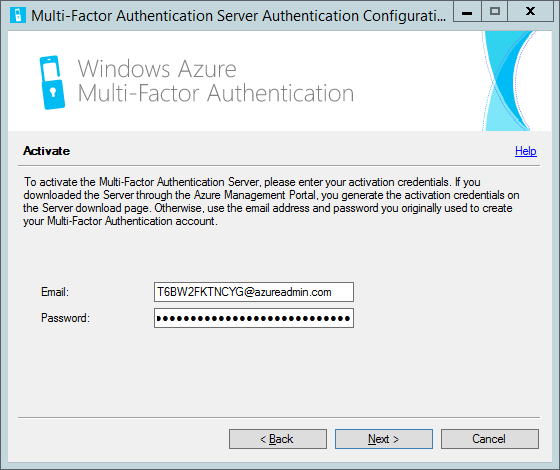 If you are enabled for Multi-Factor Authentication (MFA) in Office 365 then you will need an App Password for some applications that do not support MFA. 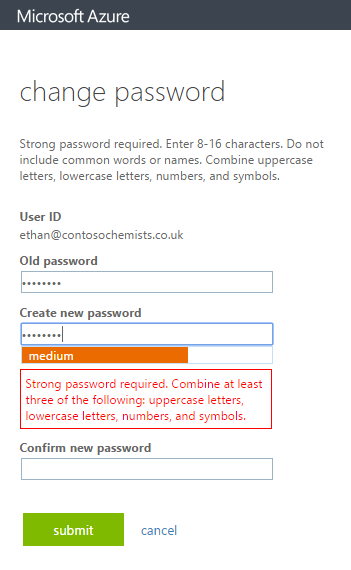 The user interface for creating a new App Password is well hidden in Office 365 (its not on the Password page for example). 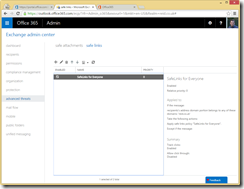 Post updated in 2016 to take account of the changes in the Office 365 portal. Post updated in Aug 2018 to take consideration of the new SSPR and MFA converged UI. 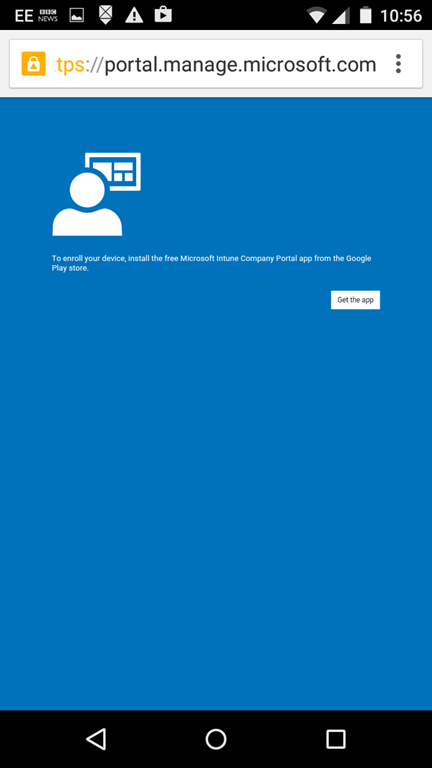 If you have this turned on then App Password changes are as described at https://docs.microsoft.com/en-gb/azure/active-directory/user-help/security-info-app-passwords. If you have not enabled this yet (late 2018 it will probably become the default regardless) then the above link will work for you. This takes you to https://account.activedirectory.windowsazure.com/AppPasswords.aspx. You can (and therefore should) bookmark this page now so you don’t need these instructions again! 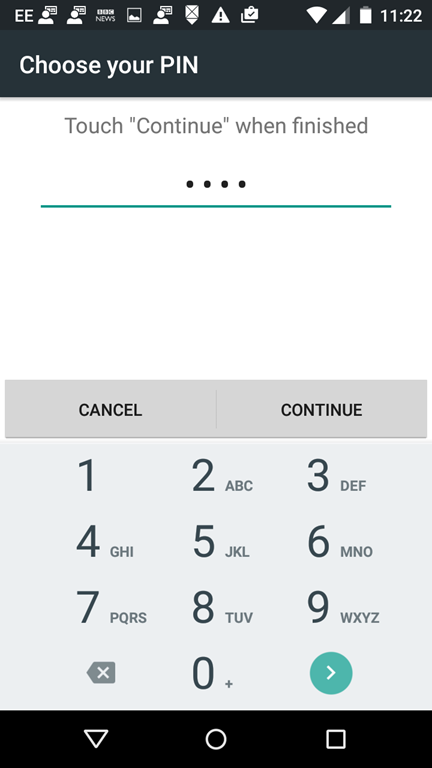 Create yourself an additional app password and give it a description. 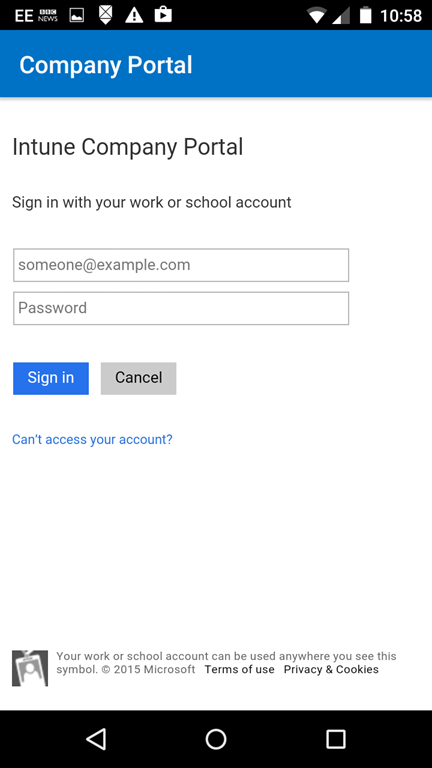 Use the new app password in the program that you need to login to. Click “app passwords” on the top menu. This takes you to https://account.activedirectory.windowsazure.com/AppPasswords.aspx. You can (and therefore should) bookmark this page now so you don’t need these instructions again! 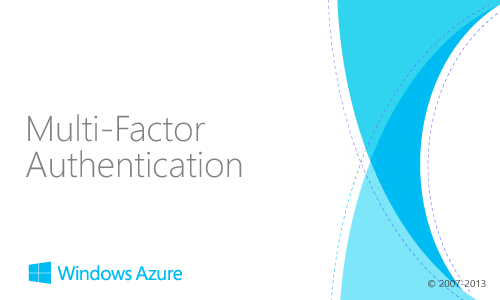 Multi-factor authentication (MFA), that is the need to have a username, password and something else to pass authentication is possible with on-premises servers using a service from Windows Azure and the Multi-Factor Authentication Server (an on-premises piece of software). The Multi-Factor Authentication Server intercepts login request to OWA, if the request is valid (that is the username and password work) then the mobile phone of the user is called or texted (or an app starts automatically on the phone) and the user validates their login. This is typically done by pressing # (if a phone call) or clicking Verify in the app, but can require the entry of a PIN as well. Note that when the MFA server intercepts the login request in OWA, there is no user interface in OWA to tell you what is happening. 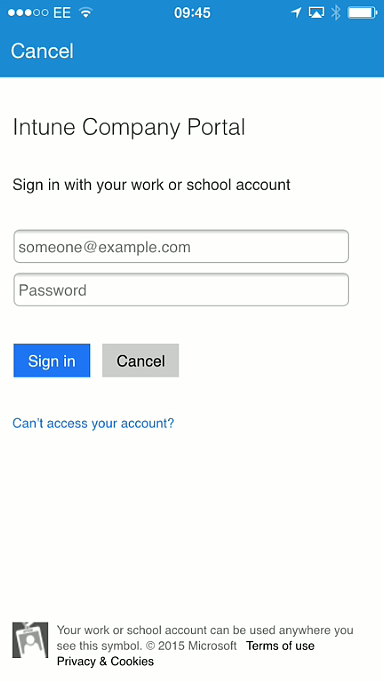 This can result in user disconnect and stops the use of two-way MFA (receive number by text, type number into web application type scenario). 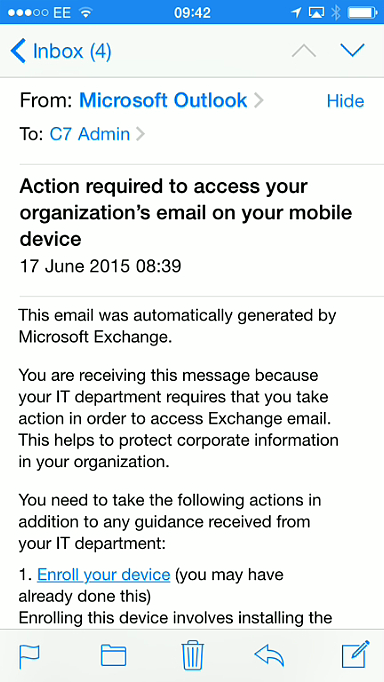 Therefore to that end, MFA directly on the OWA application is not supported by the Microsoft Exchange team. 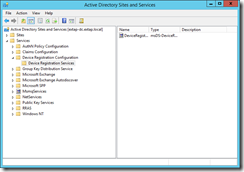 Steps for setting up ADFS for Exchange Server 2013 SP1 or later are at https://technet.microsoft.com/en-us/library/dn635116(v=exchg.150).aspx. 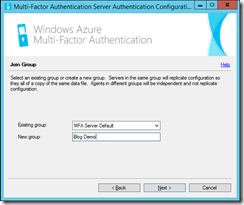 Once this is in place, you need to enable MFA for ADFS rather than MFA for OWA. 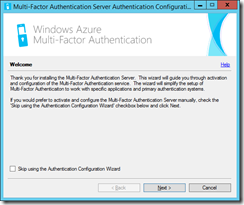 I have covered this in a separate post at http://c7solutions.com/2016/04/installing-azure-multi-factor-authentication-and-adfs. 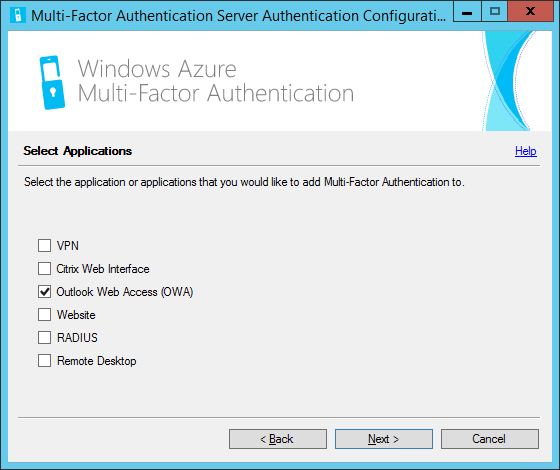 This is covered in http://c7solutions.com/2015/01/windows-rras-vpn-and-multi-factor-authentication, but the difference with OWA is that it needs to be installed on the Exchange CAS server where the authentication takes place. Ensure you have .NET 3.5 installed via Server Manager > Features. This will install the .NET 2.0 feature that is required by MFA server. If the installation of the download fails, this is the most likely reason for the failure, so install .NET 3.5 and then try the MFA Server install again. Do not skip the wizard, but click Next. You will be asked to activate the server. 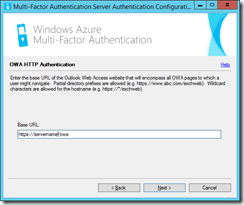 Activating the server is linking it to your Azure MFA instance. 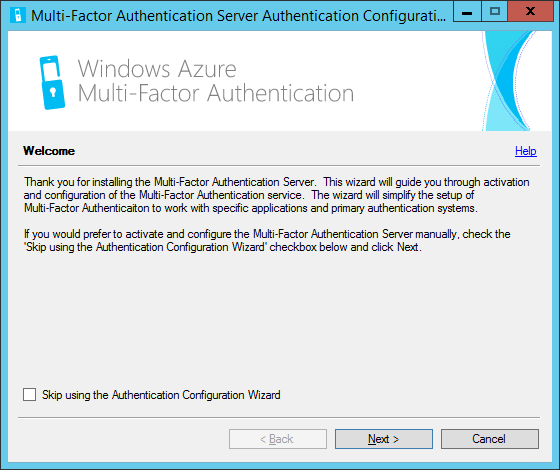 The email address and password you need are obtained from the Azure multi-factor auth provider that was configured in Step 1. 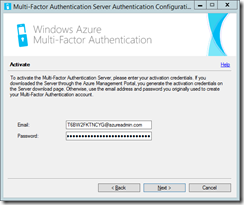 Click the Generate Activation Credentials on the Downloads page of the Azure MFA provider auth management page. The credentials are valid for ten minutes, so your will differ from mine. Enter them into the MFA Server configuration wizard and click Next. MFA Server will attempt to reach Azure over TCP 443. Select the group of servers that the configuration should replicate around. For example, if you where installing this software on each Exchange CAS server, then you might enter “Exchange Servers” as the group name in the first install and then select it during the install on the remaining servers. This config will be shared amongst all servers with the same group name. If you already have a config set up with users in it and set up a new group here, then it will be different settings for the users. 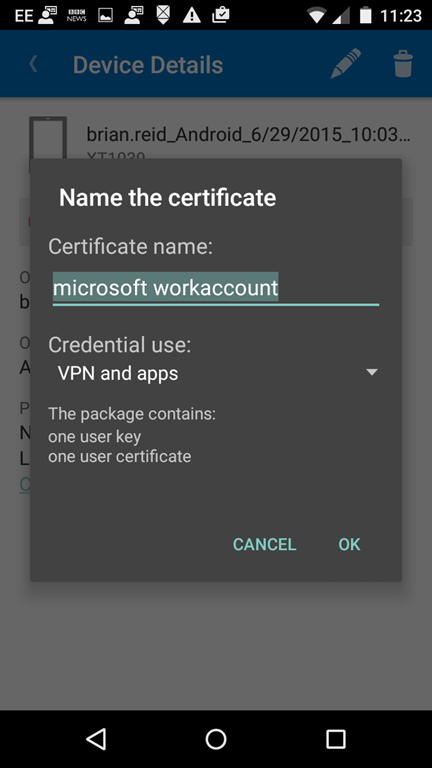 For example you might have a phone call to authenticate a VPN connection but use the app for OWA logins. This would require two configs and different groups of servers. If you want the same settings for all users in the entire company, then one group (the default group) should be configured. Next choose if you want to replicate your settings. 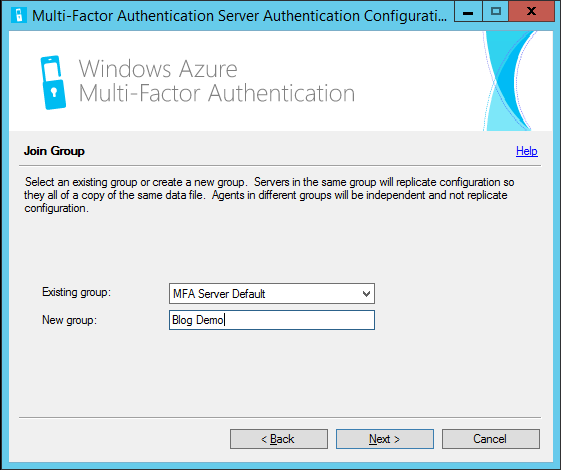 If you have more than one MFA Server instance in the same group select yes. Next I need to provide the URL to OWA. 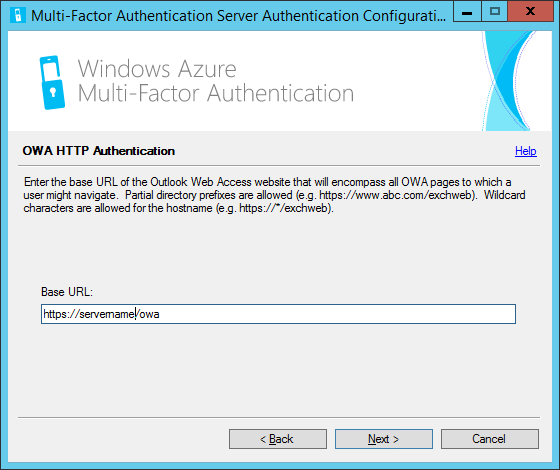 I can get this by browsing the OWA site over https. The MFA install will also use HTTPS, so you will need a certificate and have this trusted by a third party if you want to support user managed devices. Users managing their own MFA settings (such as telephone numbers and form of authentication) reduces the support requirement. That needs the User Portal, the SDK and the Mobile App webservice installed as well. These are outside the scope of this blog. For here I am going to use https://servername/owa. Finish the installation at this time and wait for the admin application to appear. Here we need to import the users who will be authenticated with MFA. 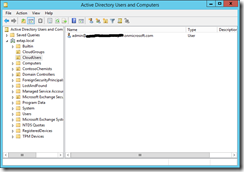 Select the Users area and click Import from Active Directory. Browse the settings to imports group members, or OUs or a search to add your user account. Once you have it working for yourself, add others. Users not listed here will not see any change in their authentication method. 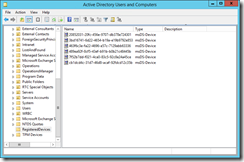 Ensure that your test user has a mobile number imported from the Active Directory. If not add one, choosing the correct country code as well. The default authentication for the user is that they will get a phone call to this number and need to press # before they can be logged in. Ensure that the user is set to Enabled as well in the users area of the management program. 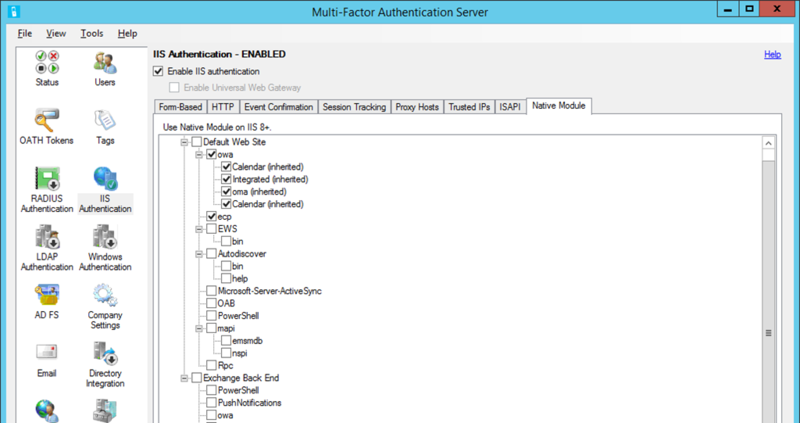 On the IIS Authentication node you can adjust the default configuration for HTTP. 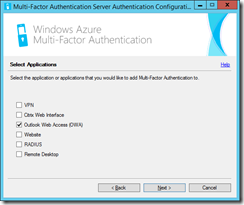 Here you need to set Require Multi-Factor Authentication user match. This ensures that each auth attempt is matched to a user in the users list. If the user exists and is enabled, then do MFA for them. If disabled, then the setting for Succeed Authentication on the advanced tab comes into play. If the user is not listed, authentication passes through without MFA. Then I can attempt a login to OWA or ECP. Once I successfully authenticate my phone rings and I am prompted to press #. Once I press # I am allowed into Exchange!